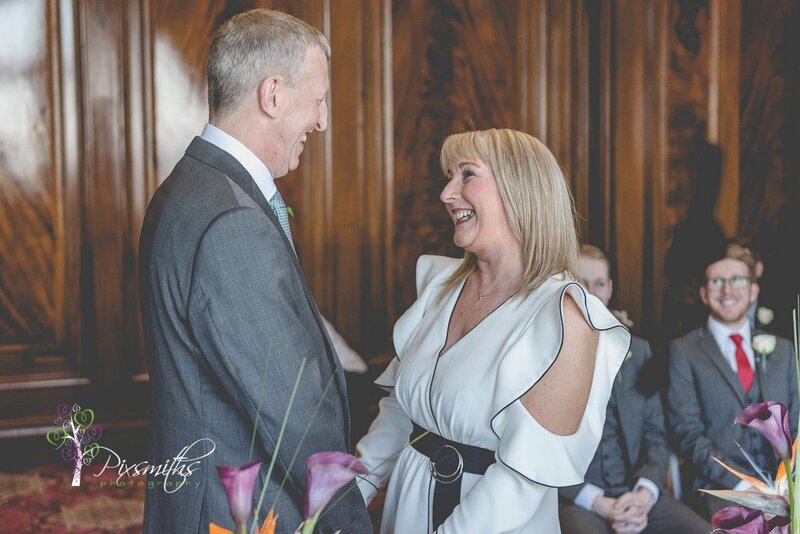 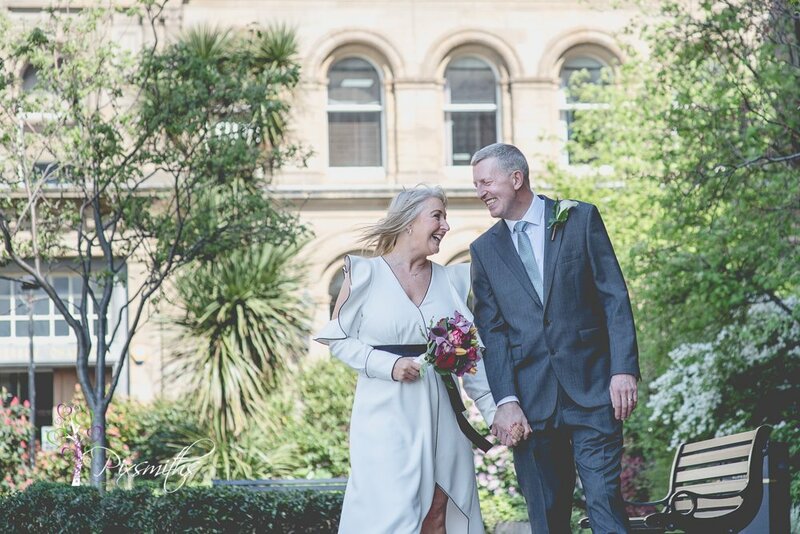 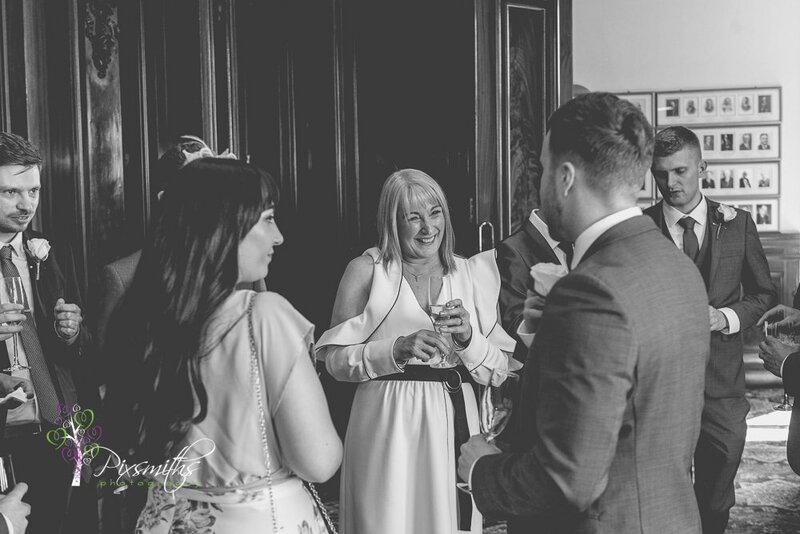 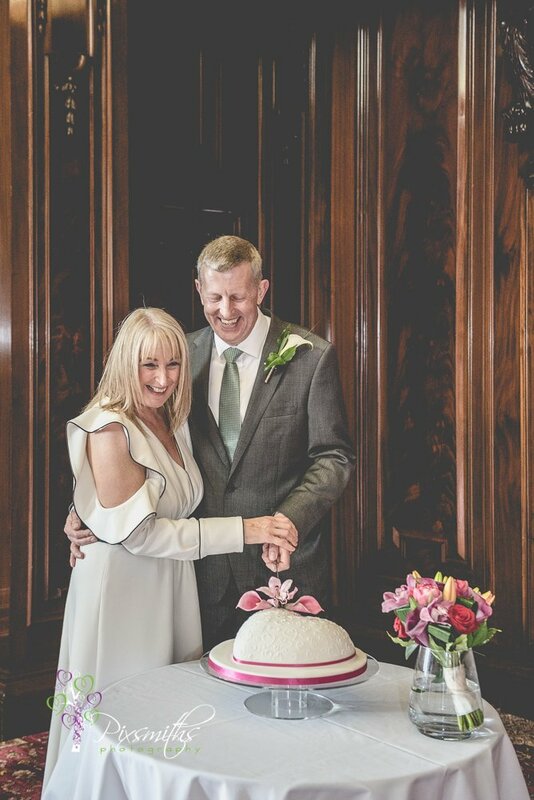 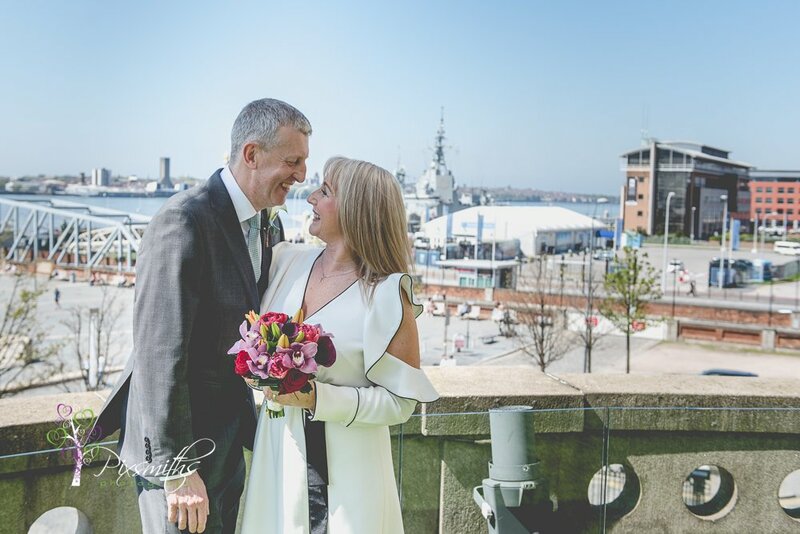 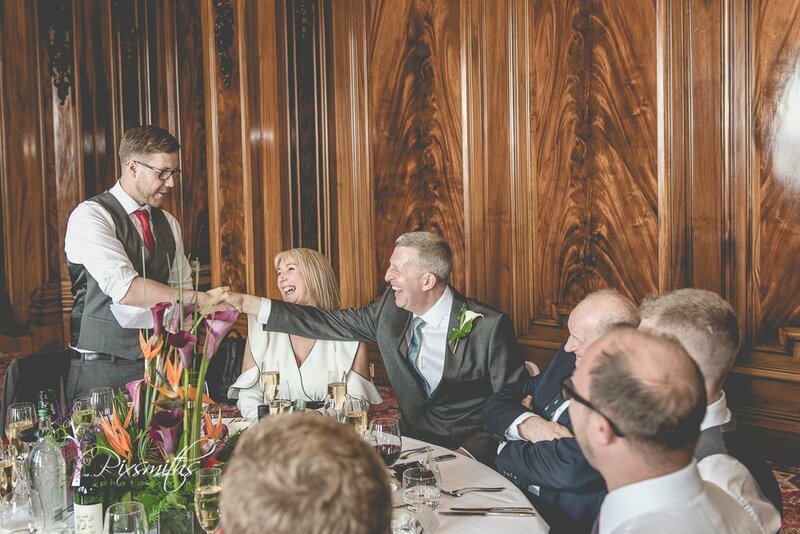 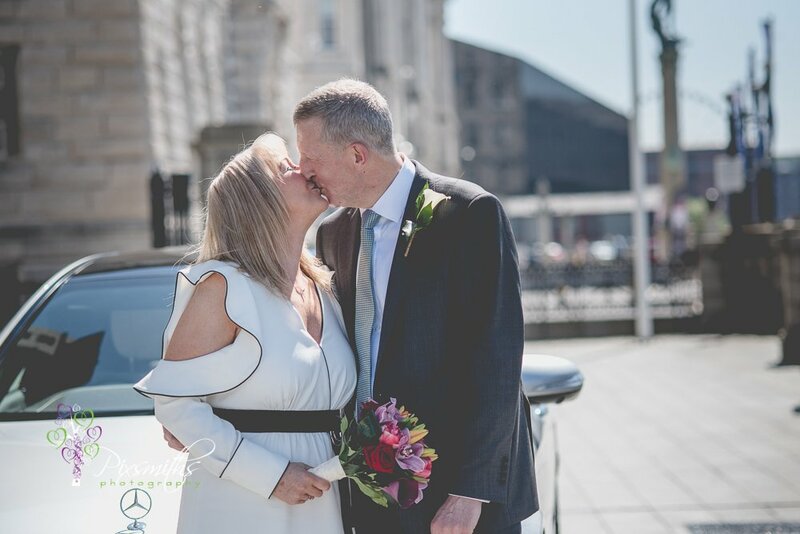 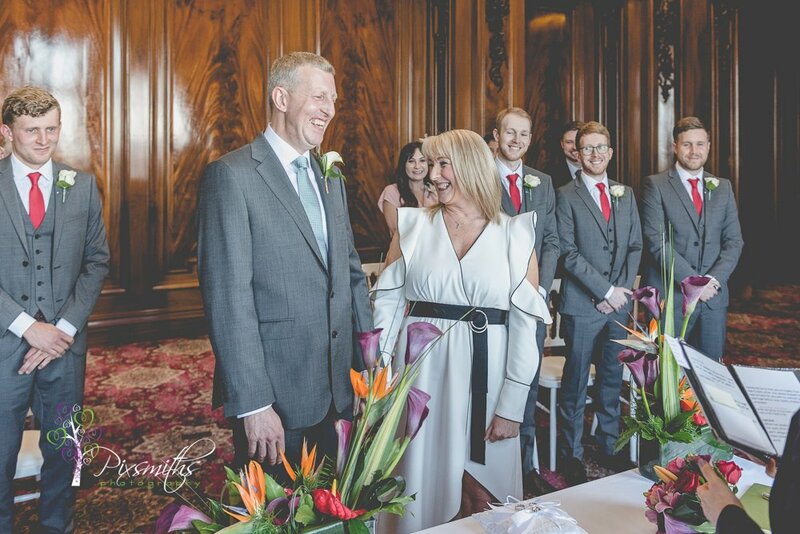 Its not everyday that the Royal Liver Building Boardroom is used for a wedding so it was a great pleasure to be asked to capture Colin and Barbara’s day here early in May. 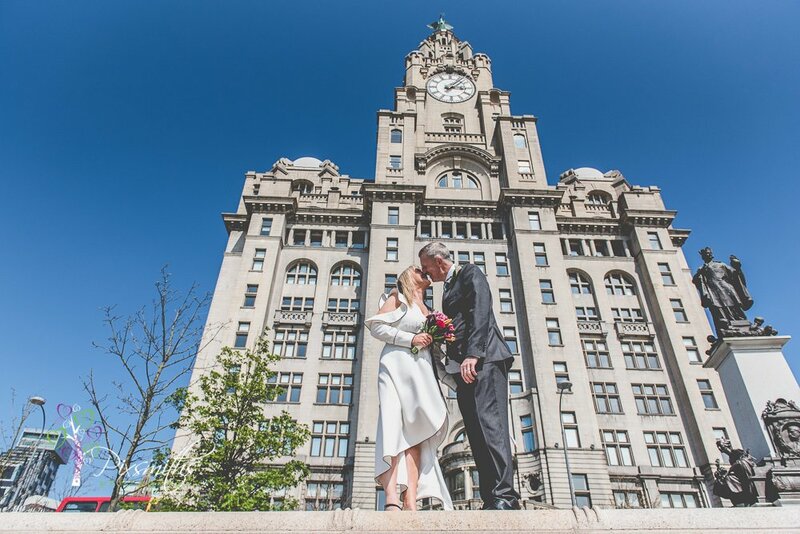 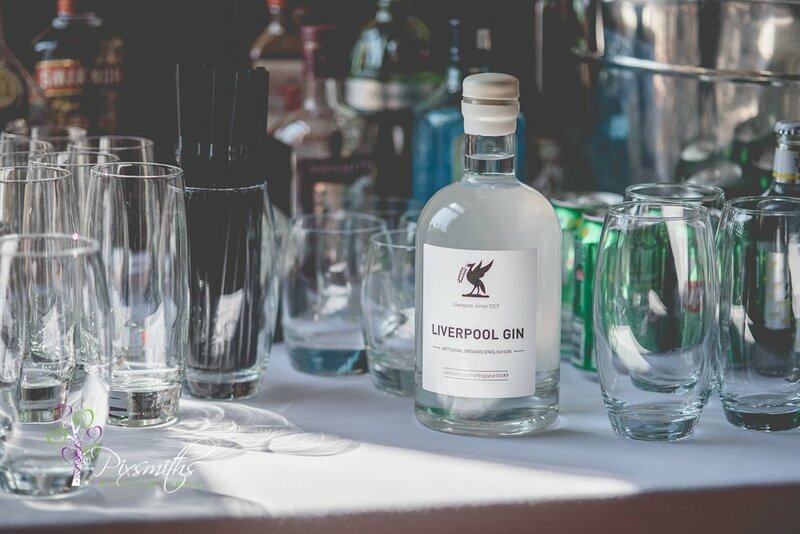 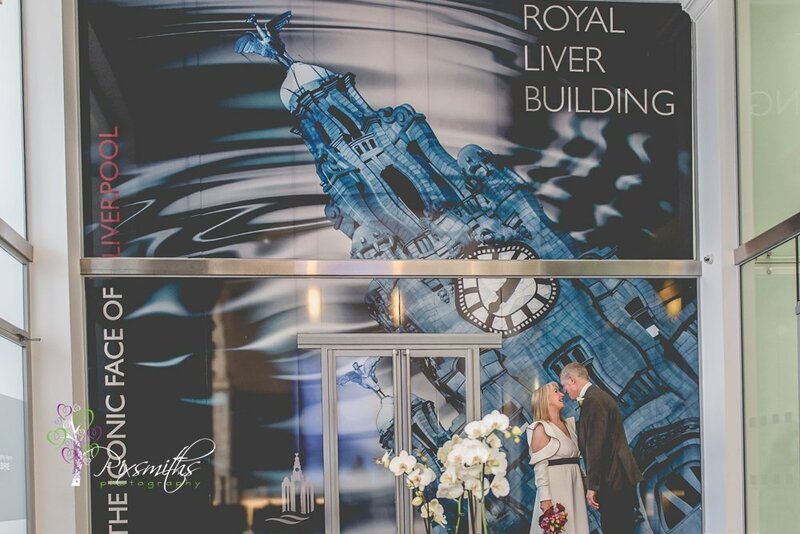 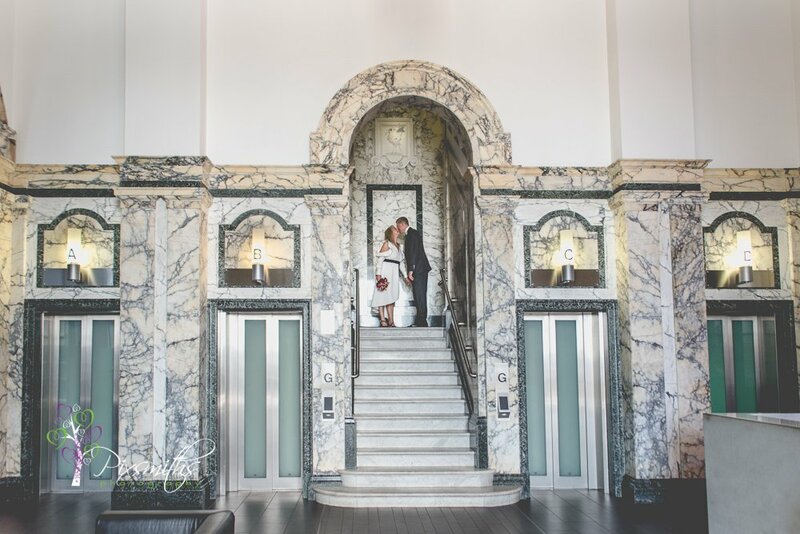 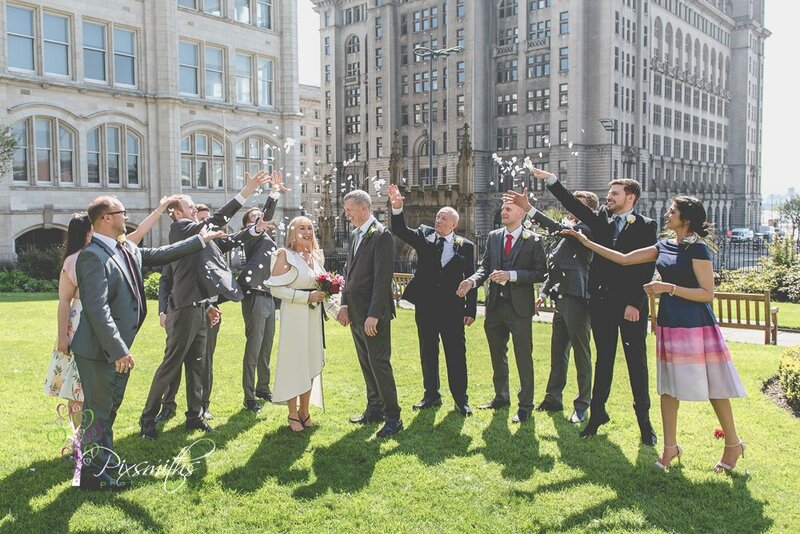 The iconic Liver Building, a wonderful setting for a Liverpool city centre wedding and perfect for an elegant intimate ceremony and private reception. 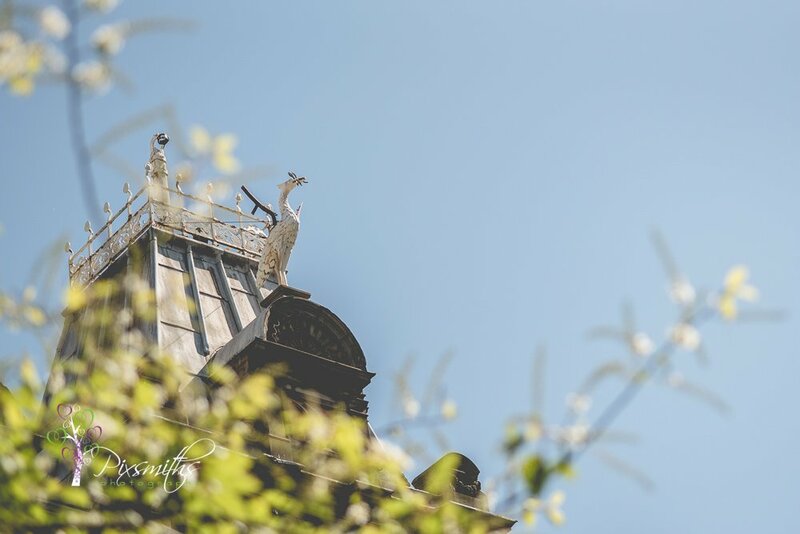 A really bright sunny day – we really have been blessed with good weather for the Bank Holiday this May. 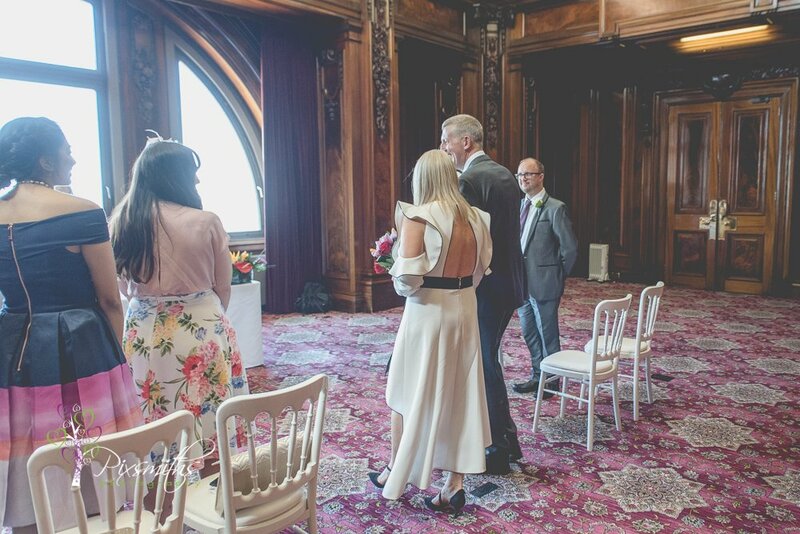 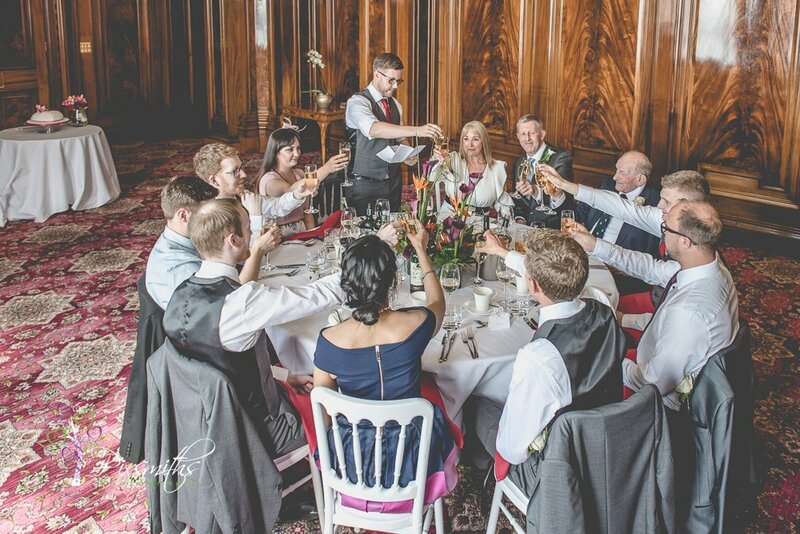 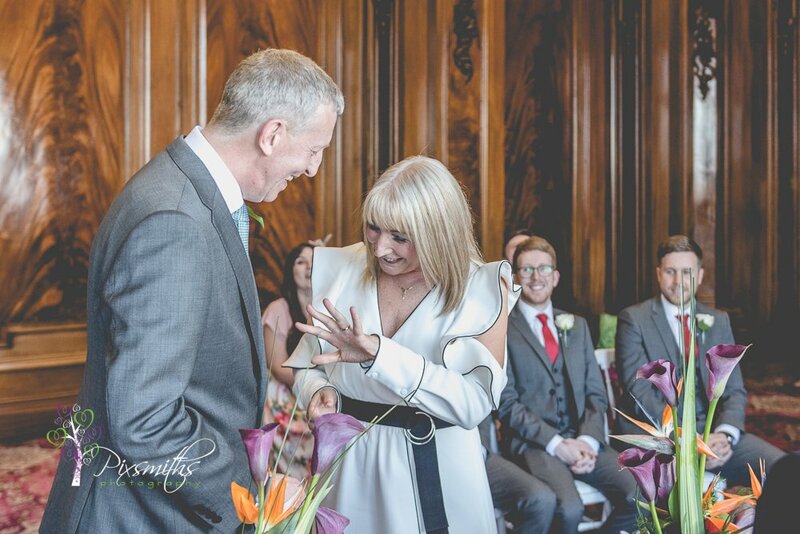 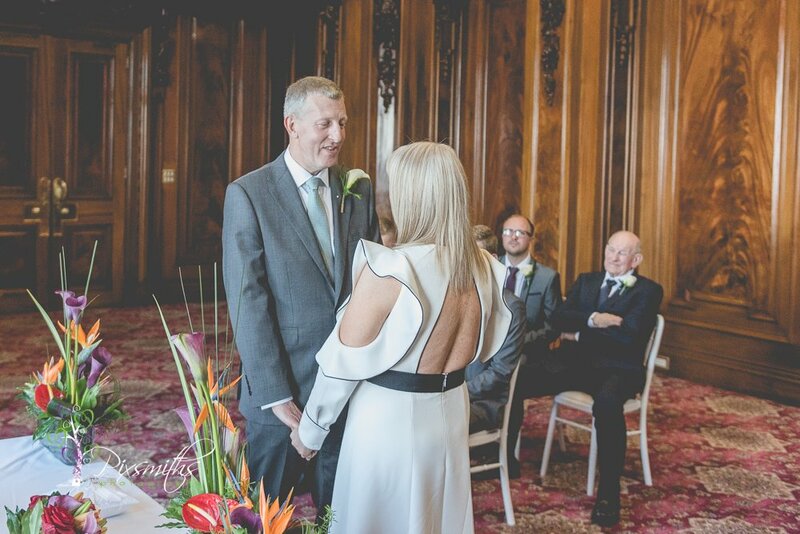 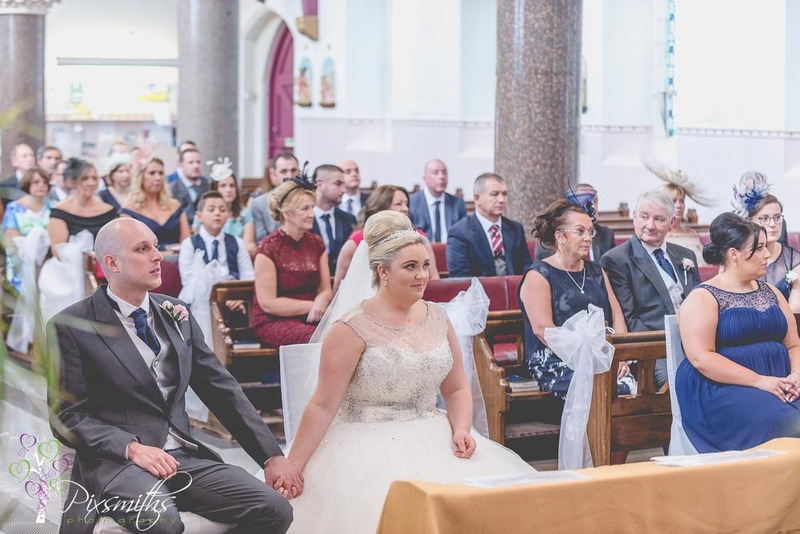 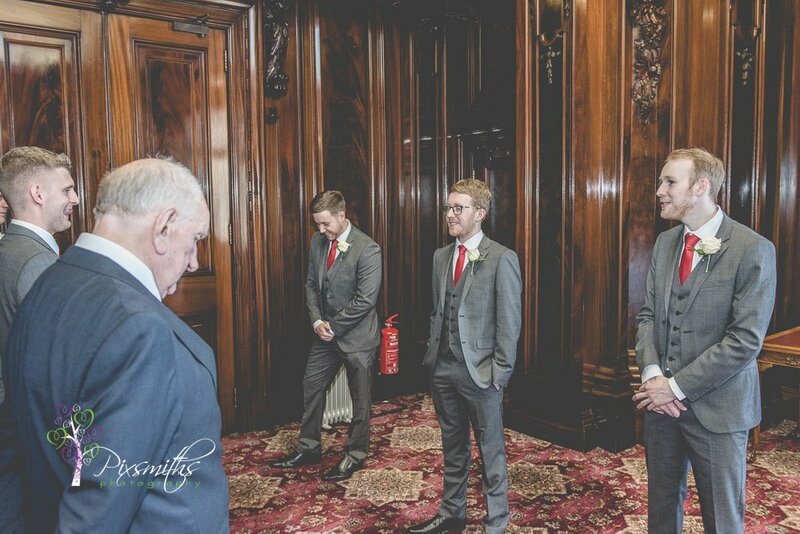 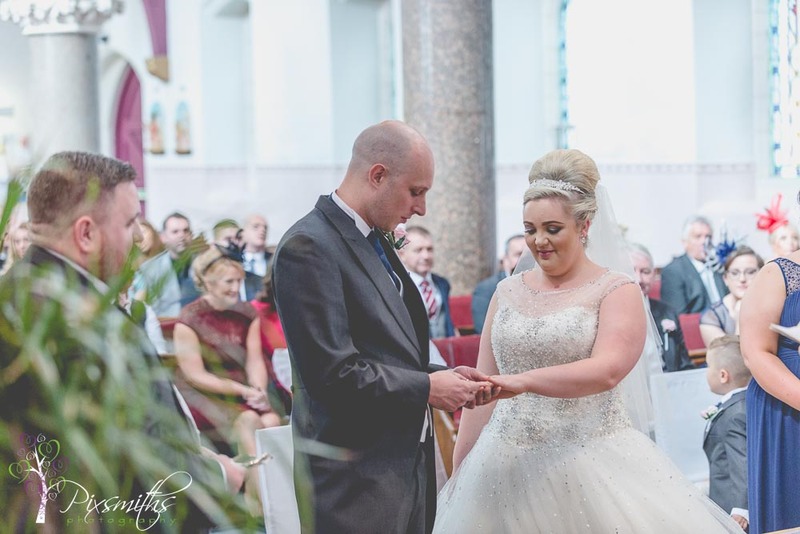 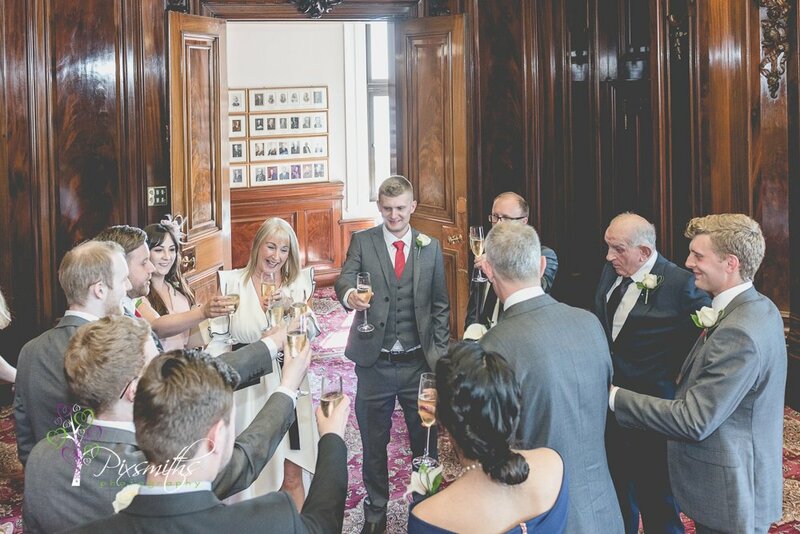 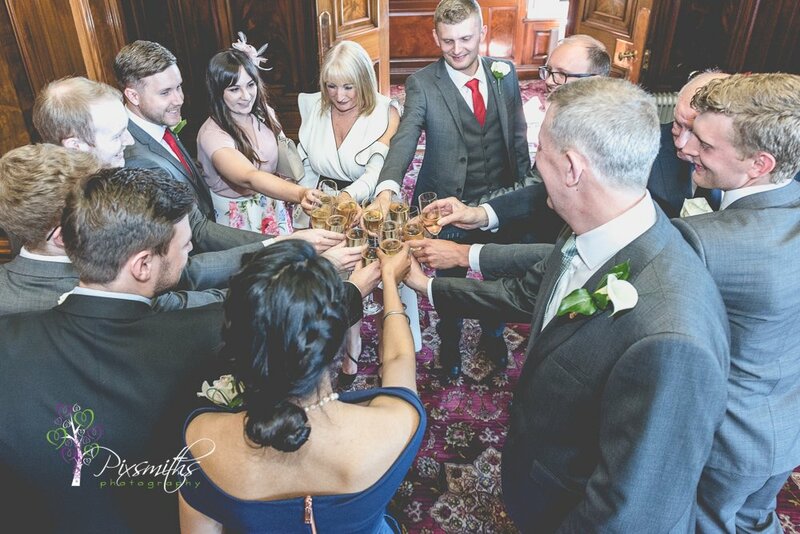 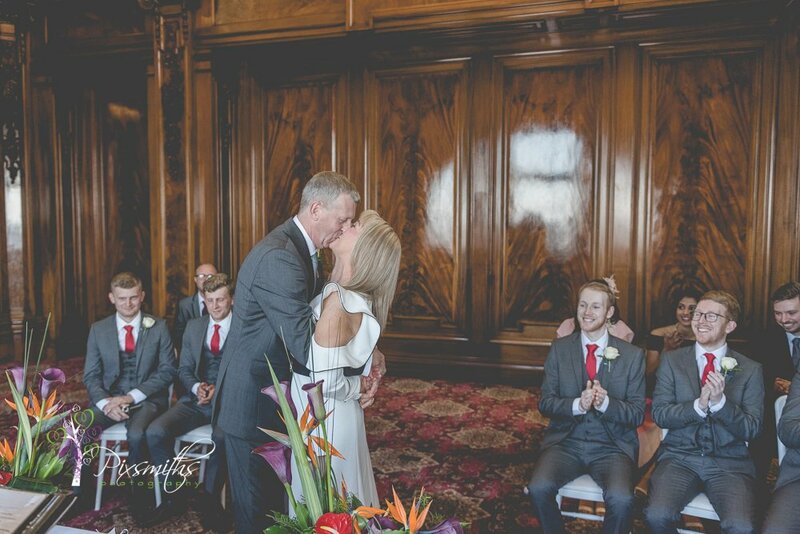 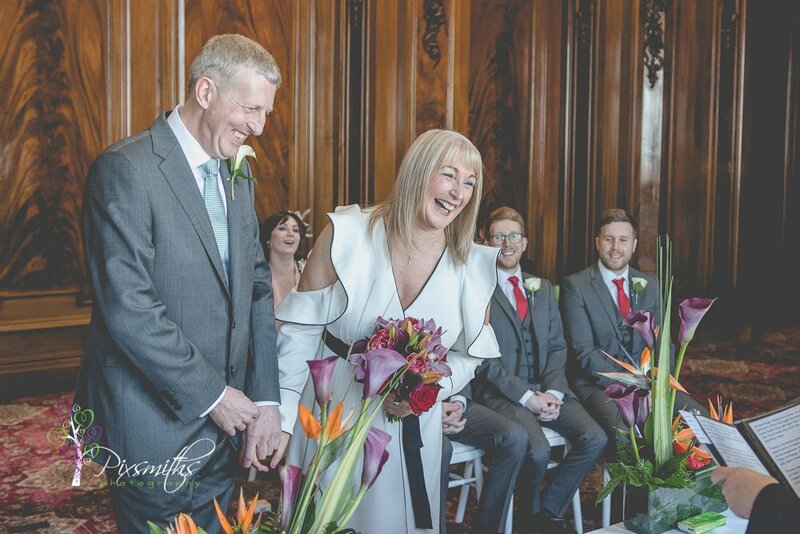 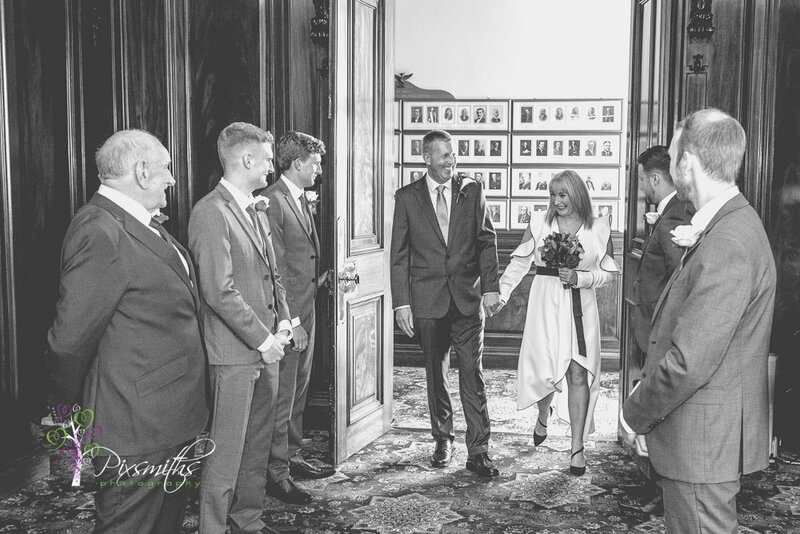 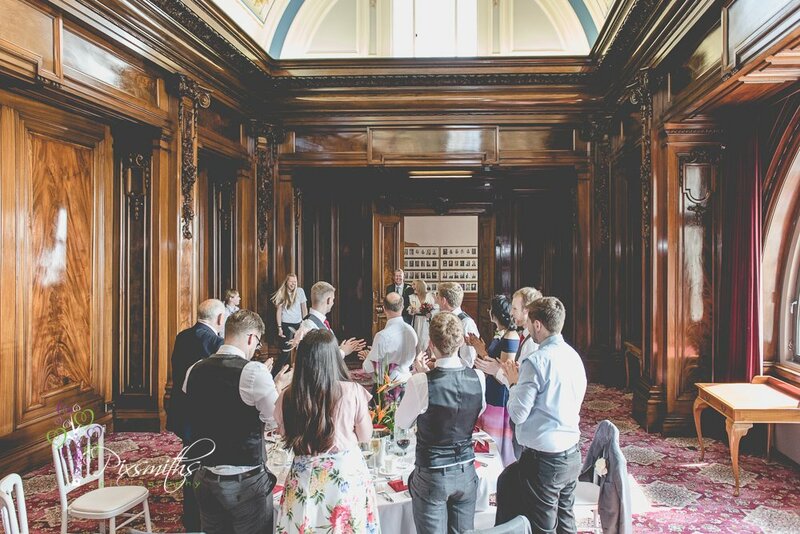 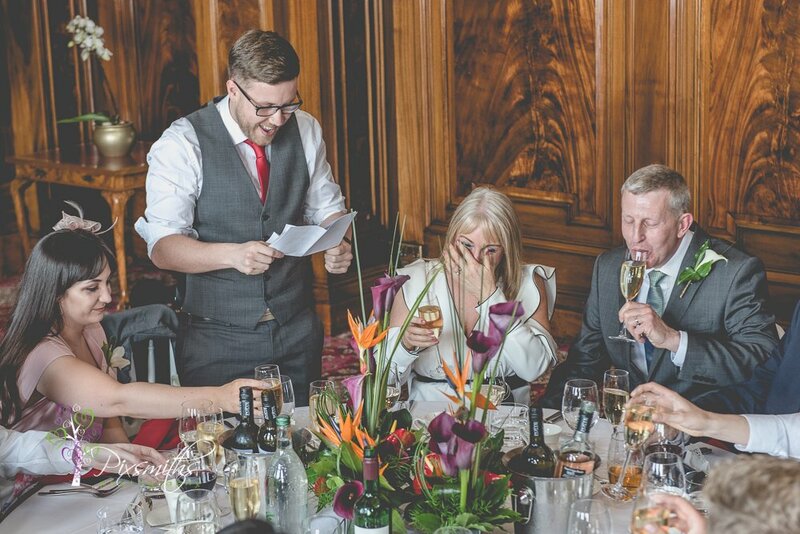 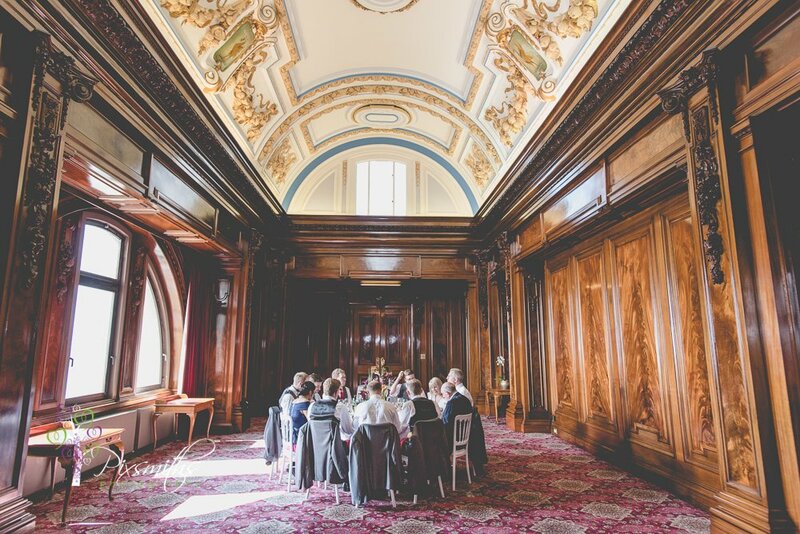 A beautiful ceremony in the Royal Liver Building boardroom, with its warm wood panelling, ornate ceiling and Liver bird motifs and of course river views of teh Mersey. 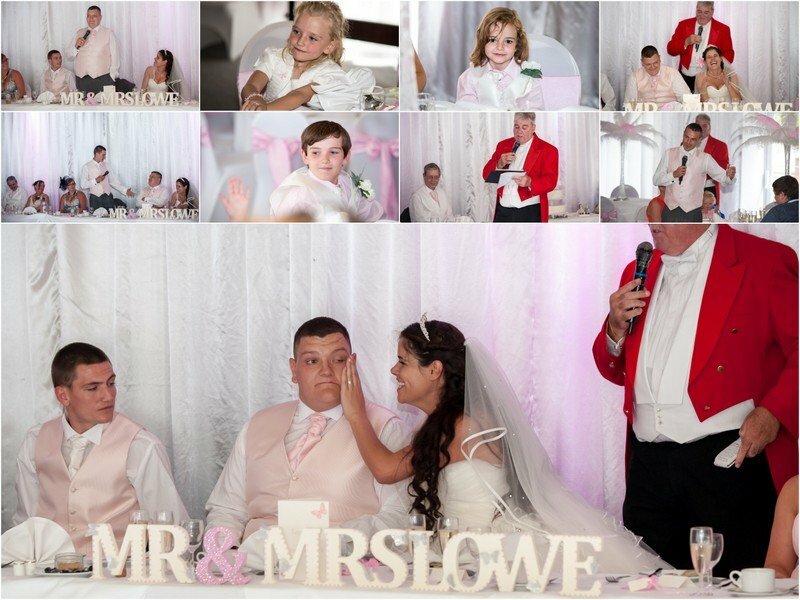 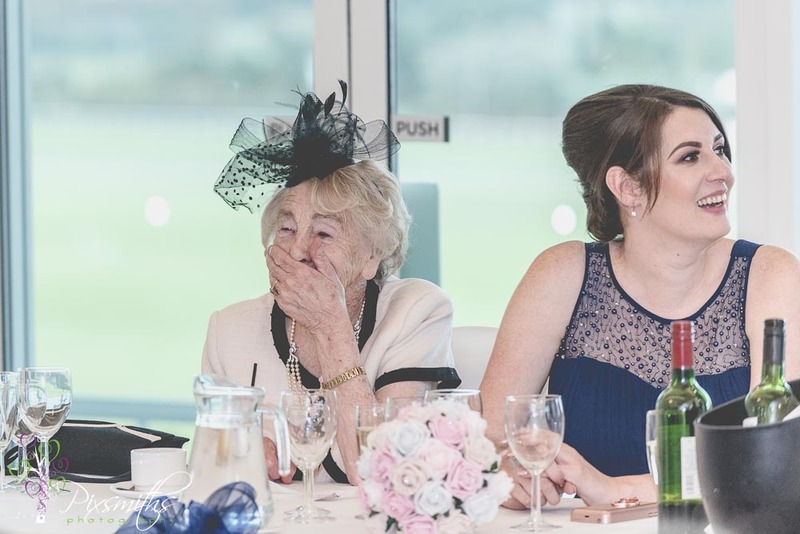 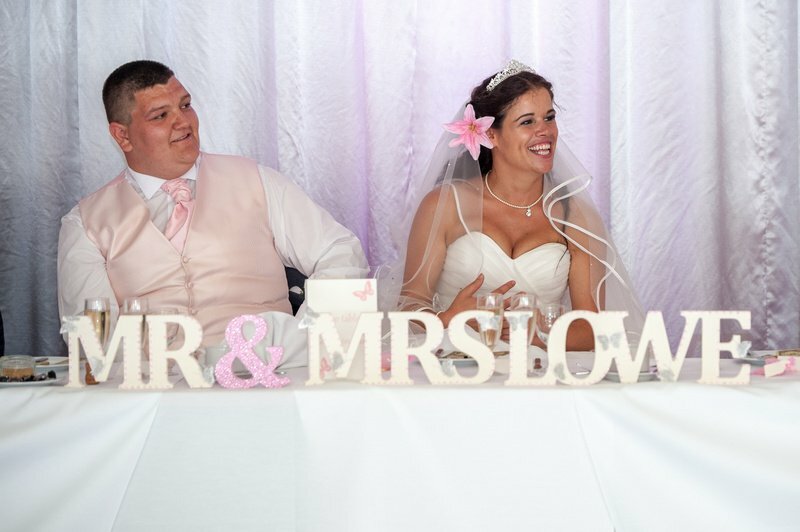 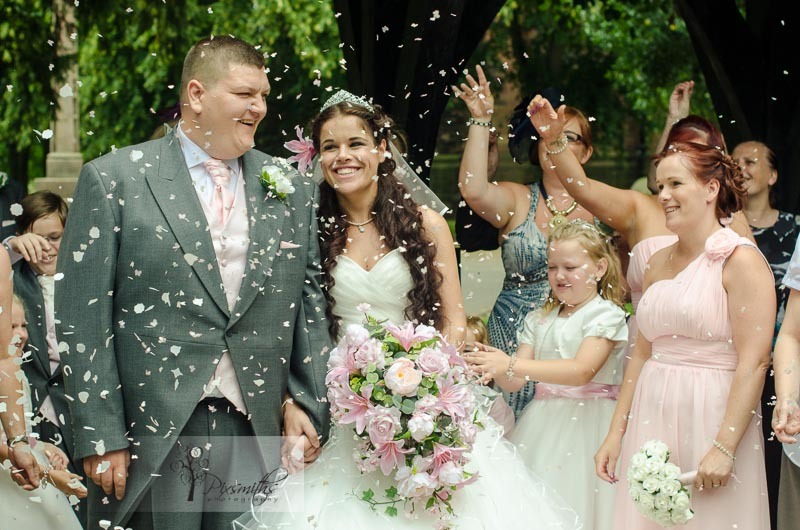 A relaxed wedding, lots of giggles and smiles. 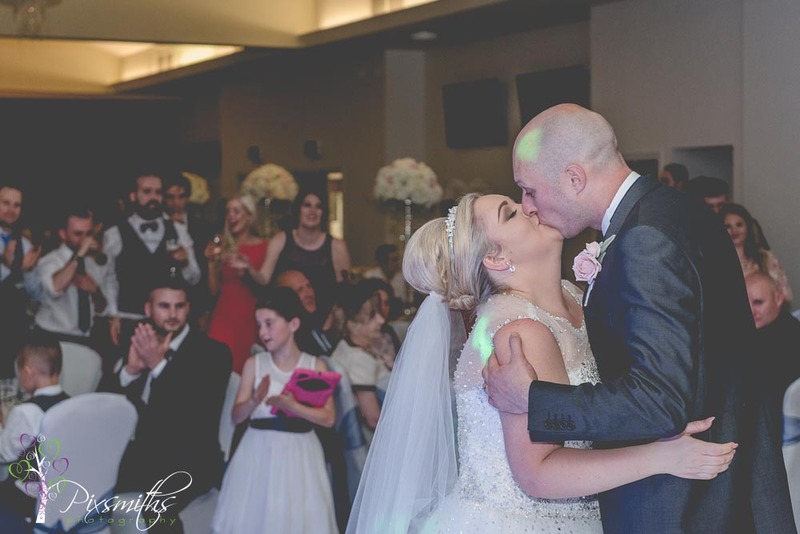 Even a few kisses before the official first kiss! 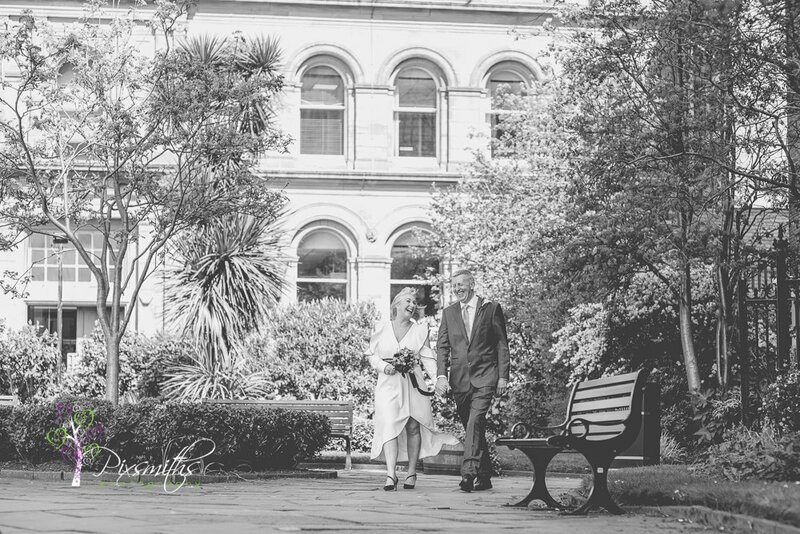 Soon it was time for celebratory drinks and canapes before heading to the nearby St Nicholas Gardens for some family pictures. 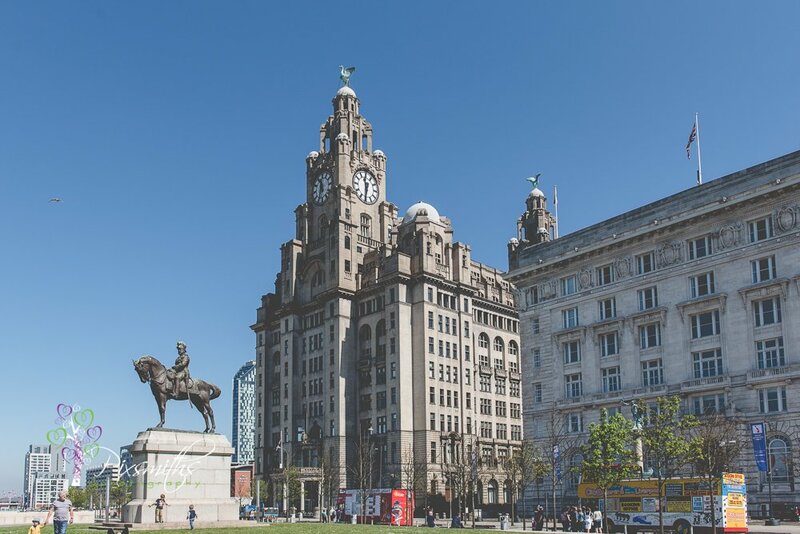 – spot another Liver Bird in the gardens! 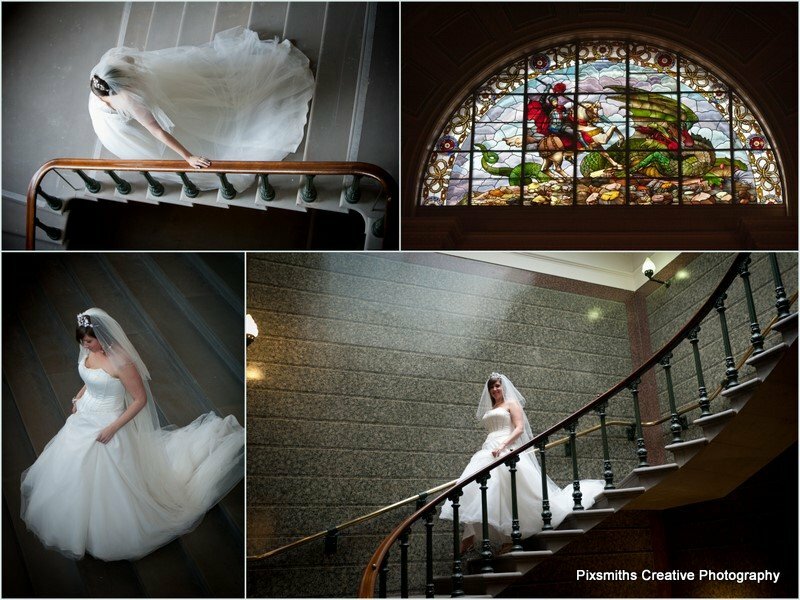 On the way down there was a stop at the balcony for some pictures too of the couple. 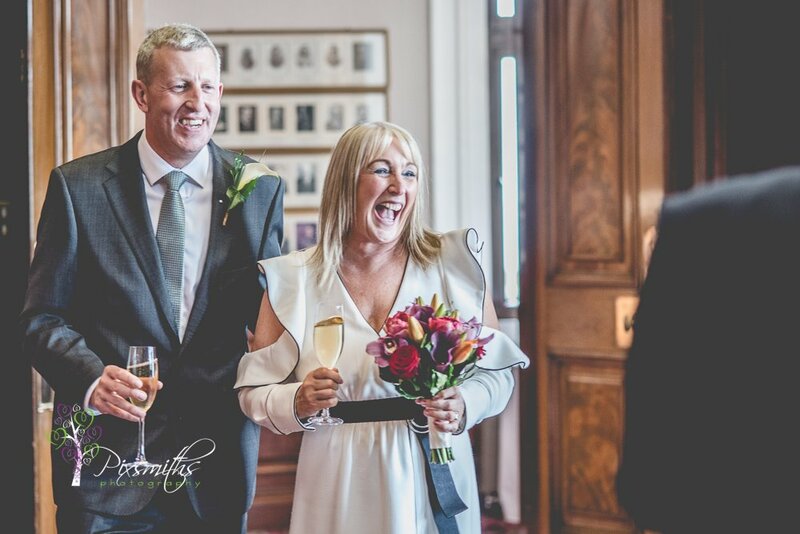 Their joy really was infectious! 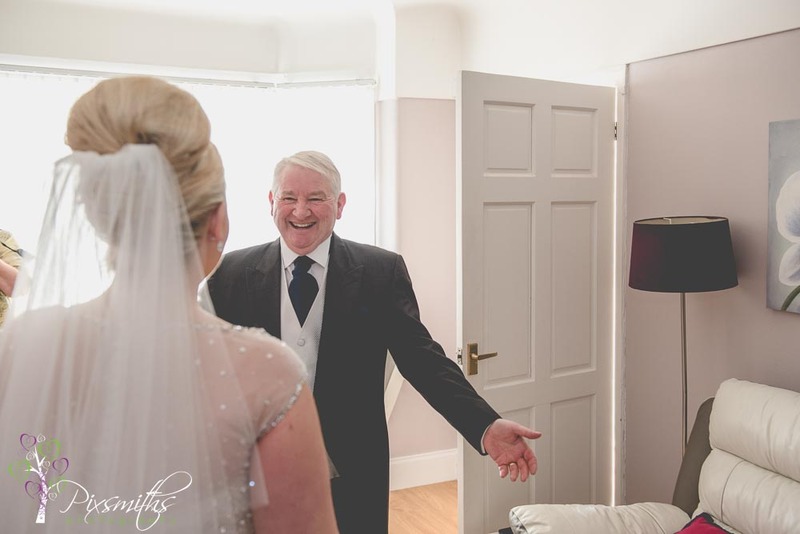 So glad you had a wonderful time Barbara and Colin, such a joy to capture your obvious happiness. 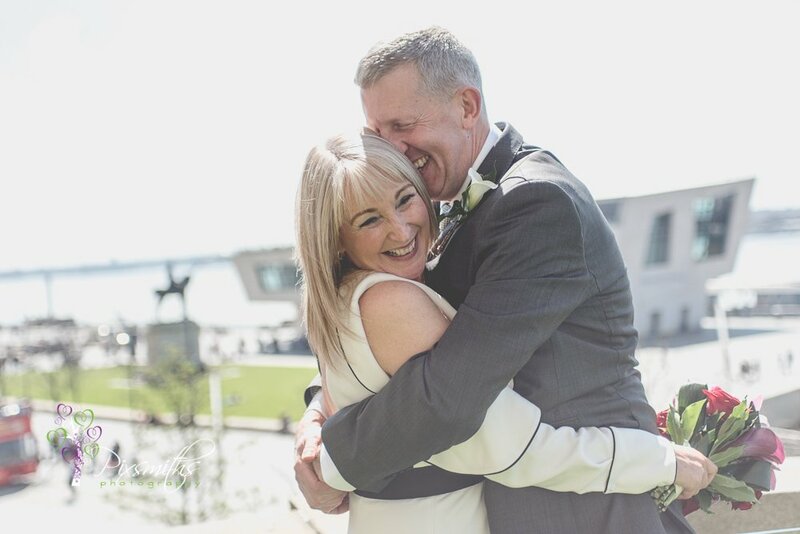 Delighted to be in Liverpool for our first wedding Aintree Racecourse and what a delight it was! 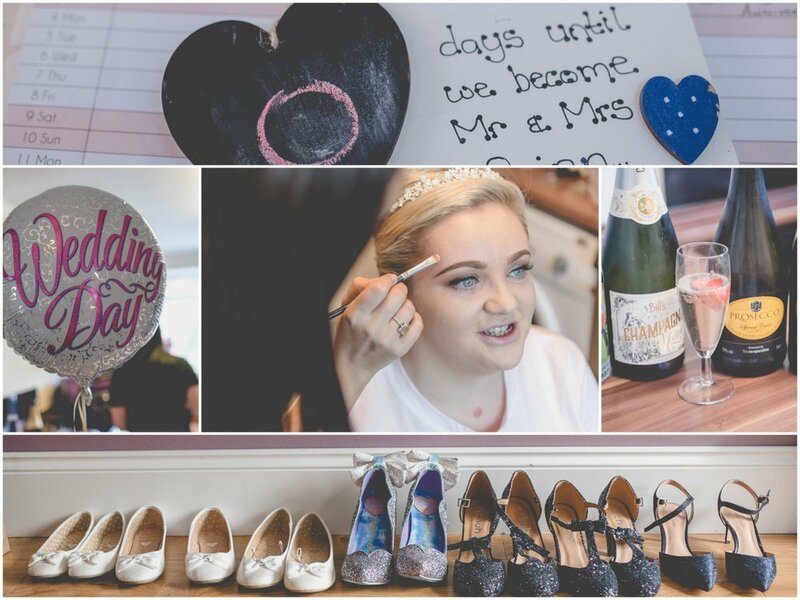 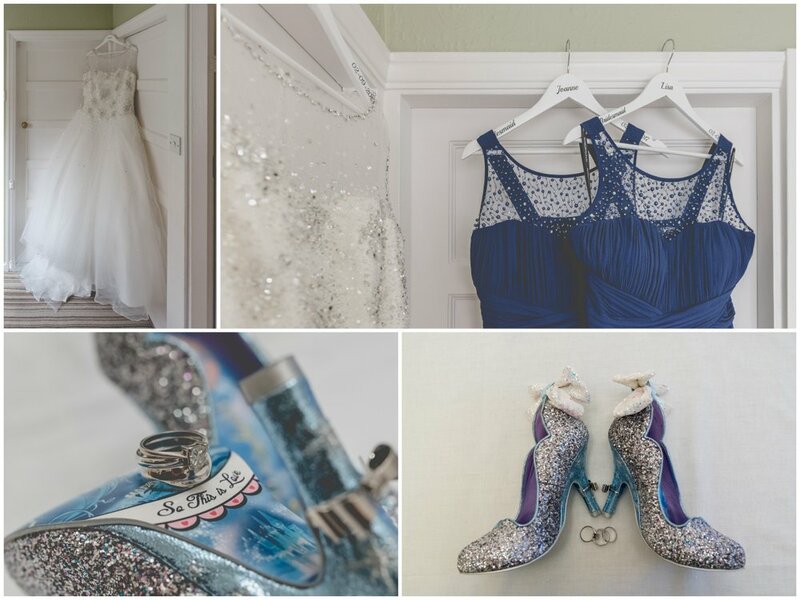 she knew exactly what she wanted – iin fact her sparkly Alternative choice Disney shoes had already had their own photoshoot prior to the wedding! 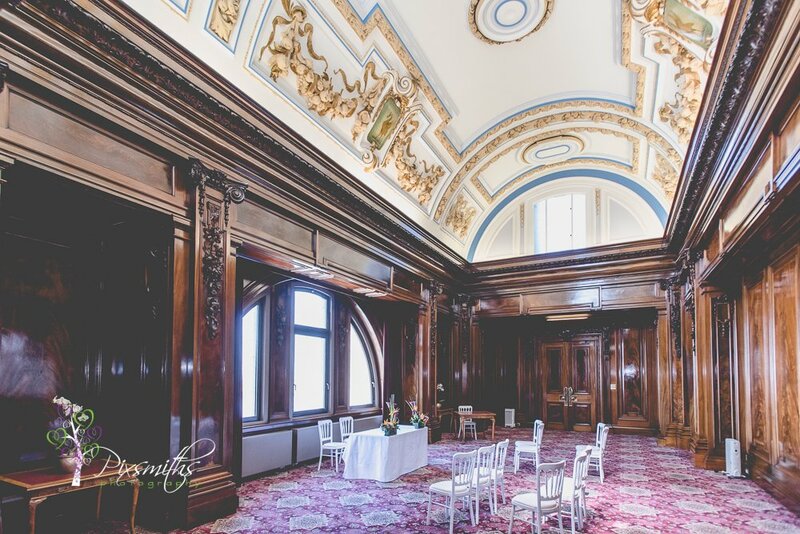 The Princess Royal Suite has undergone a refurbishment and wow its a fabulous reception space. 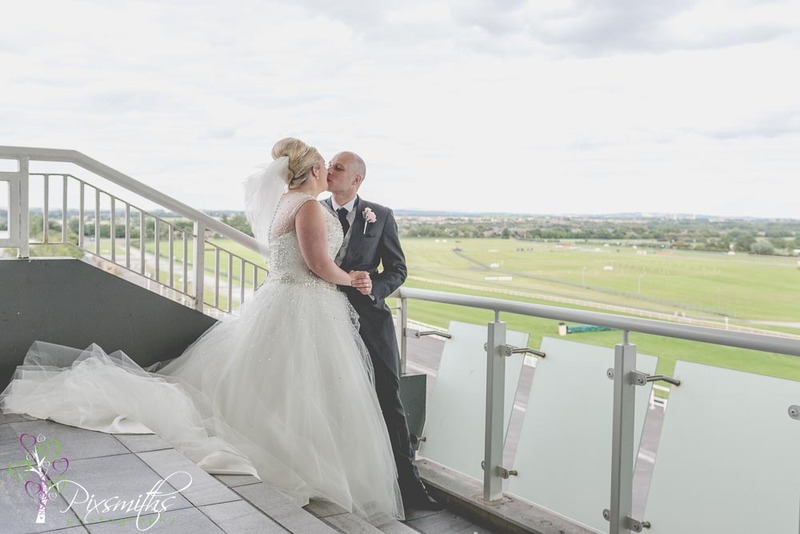 Being high up there are wide reaching views over the racecourse. 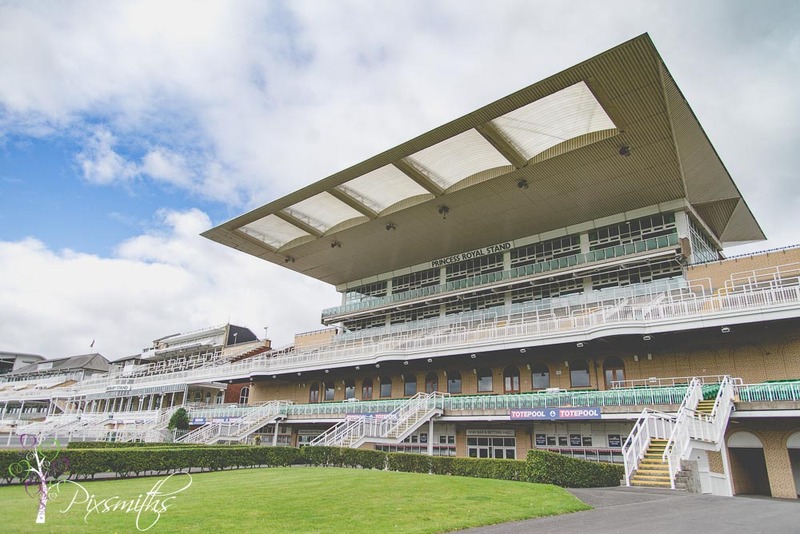 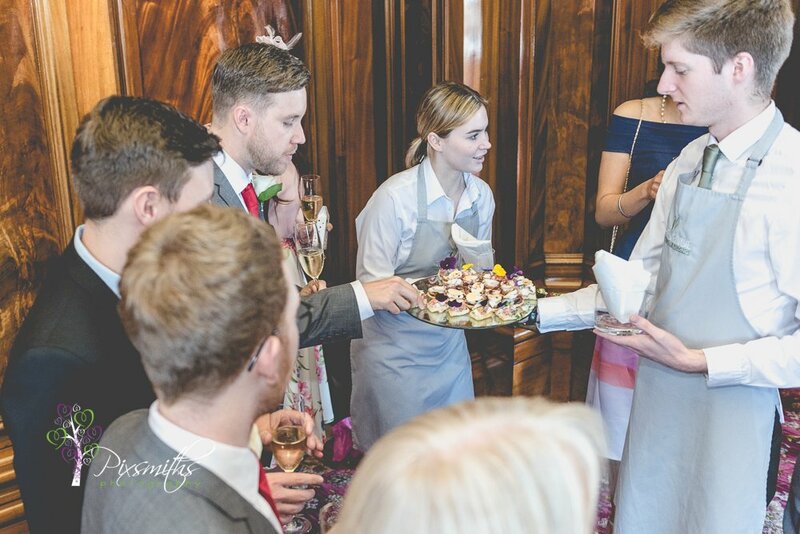 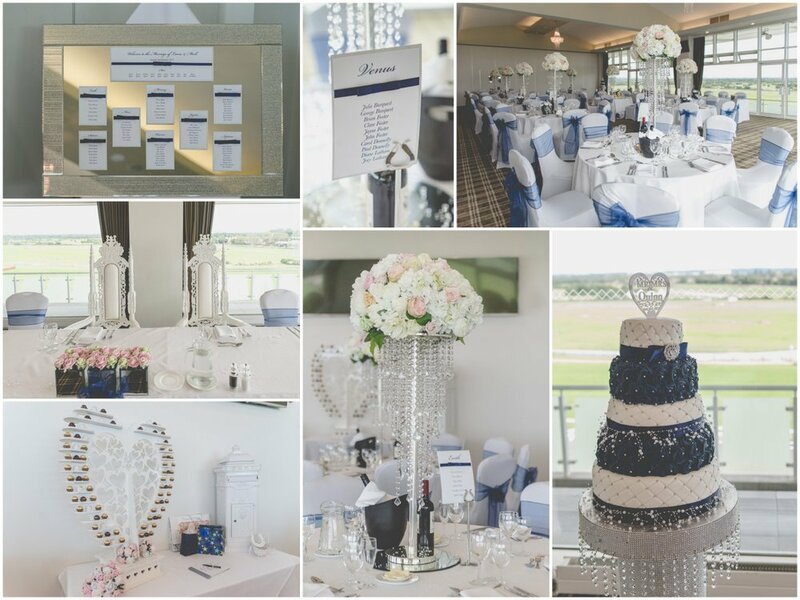 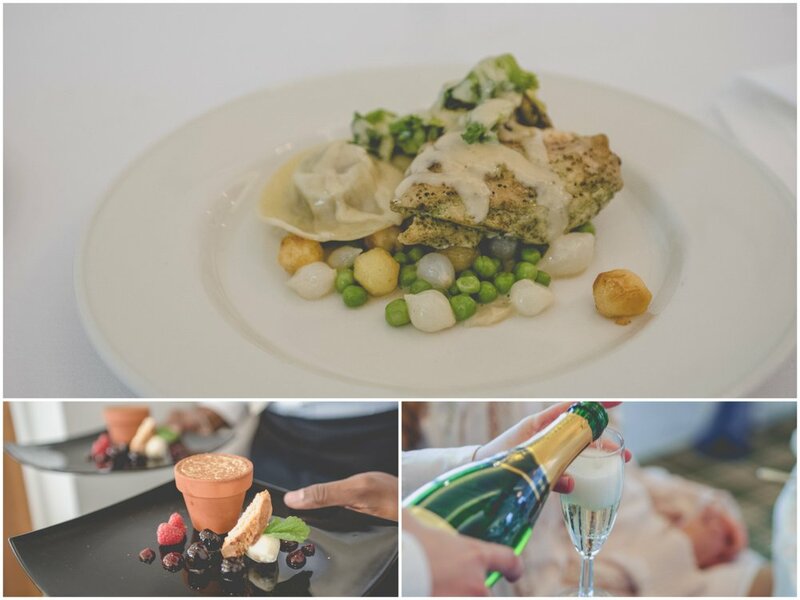 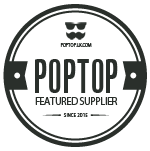 The catering was excellent as you would expect at the Jockey club – we appreciate them looking after us! 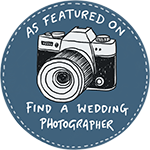 – check out the food pics! 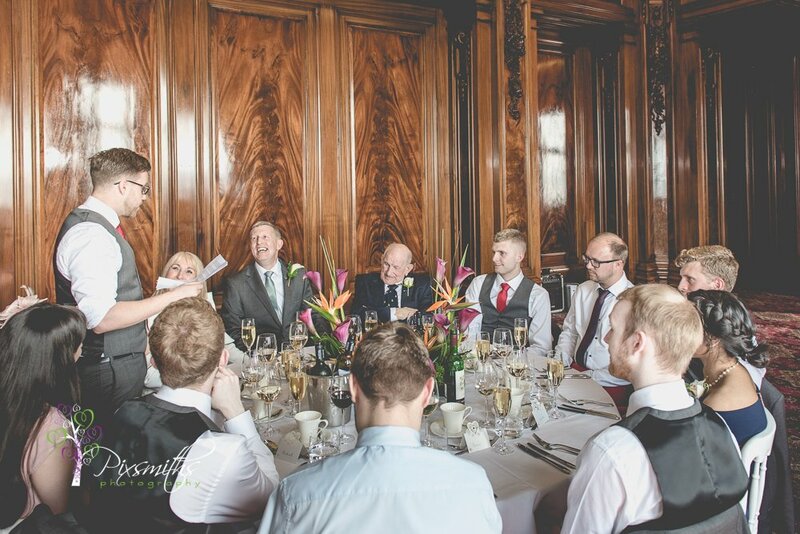 Speeches were short and suit and everyone enjoyed a wonderful evening in this fabulous venue. 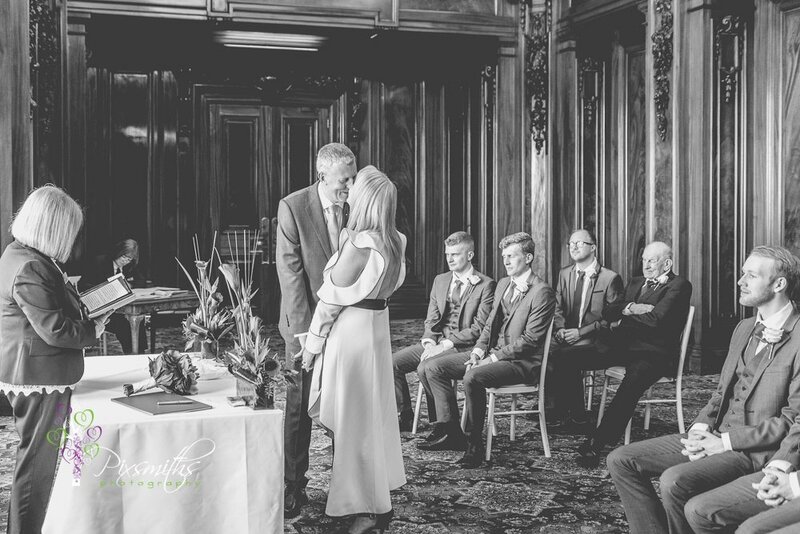 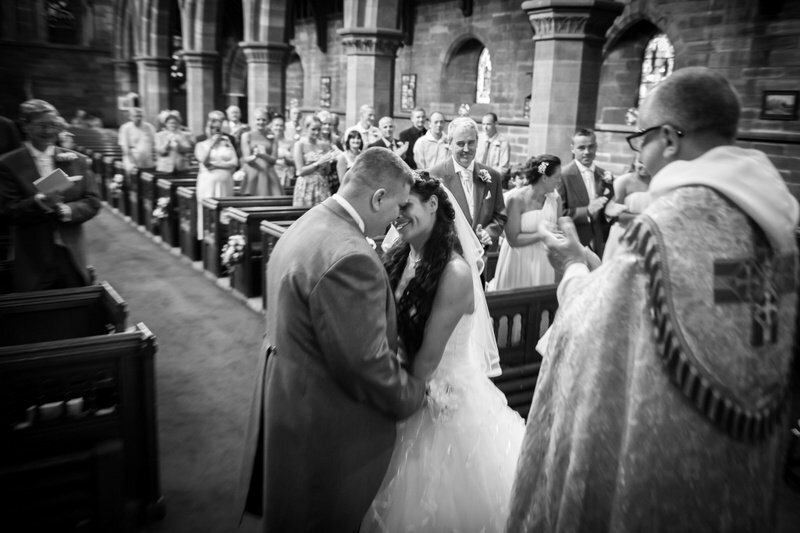 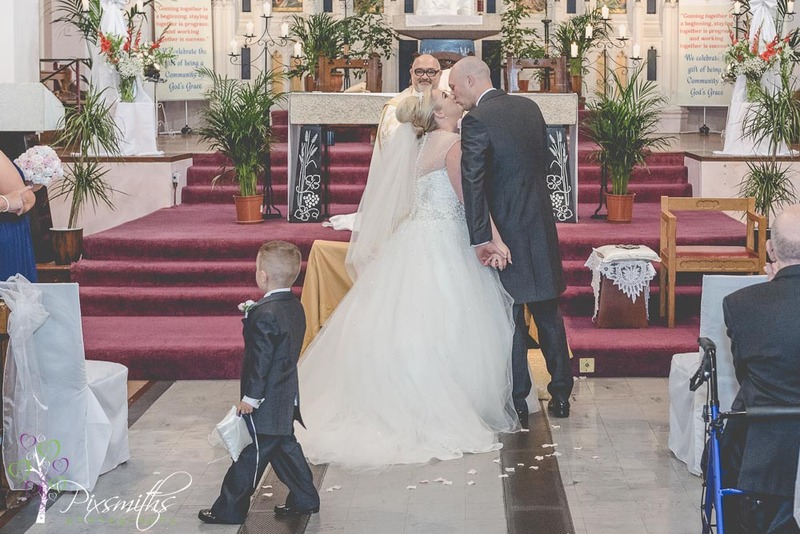 Three emotional dances with Dad, mum and then husband and wife took to the floor. 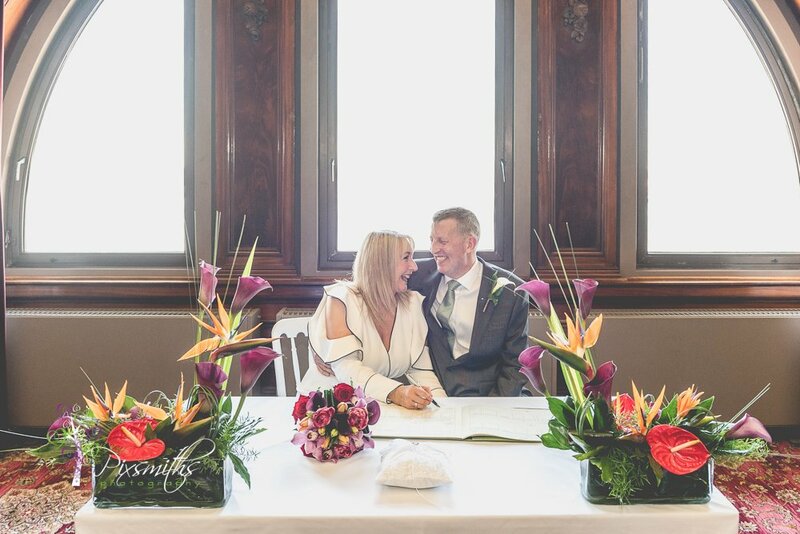 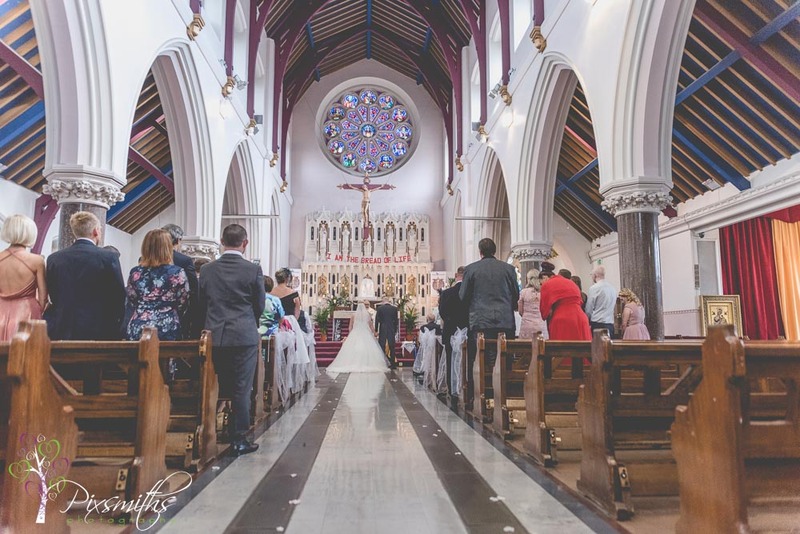 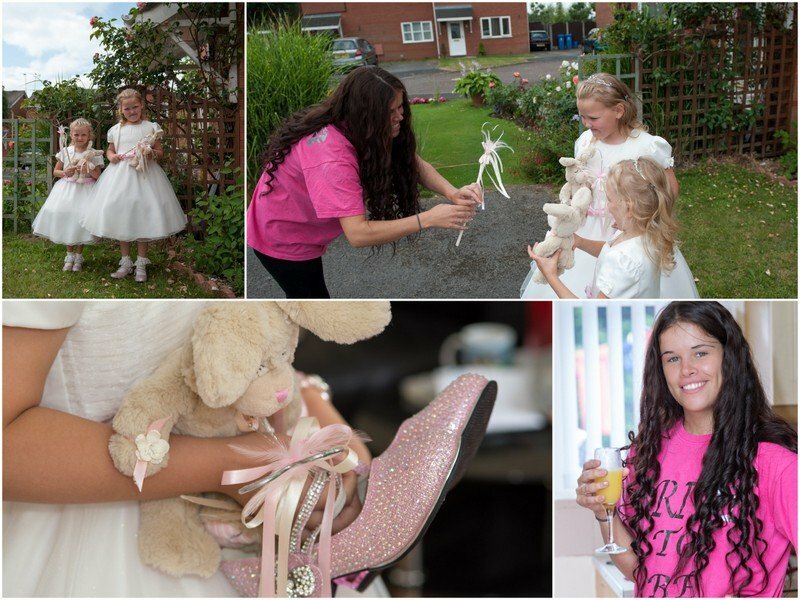 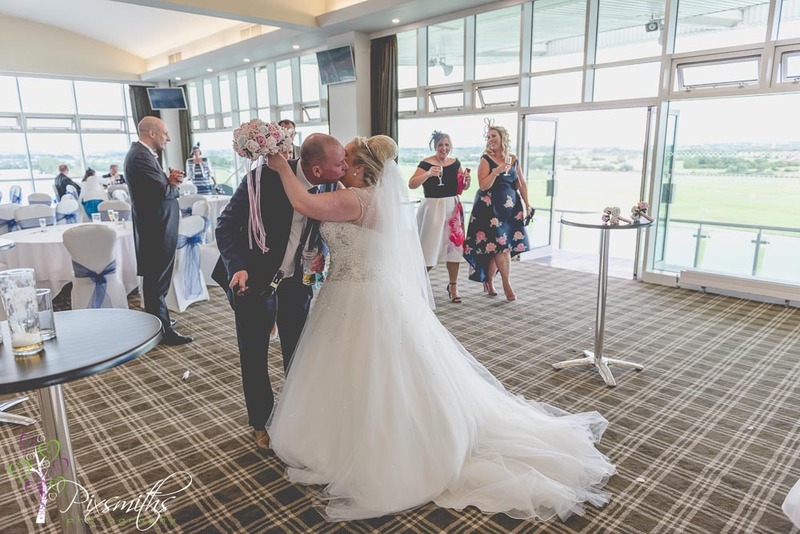 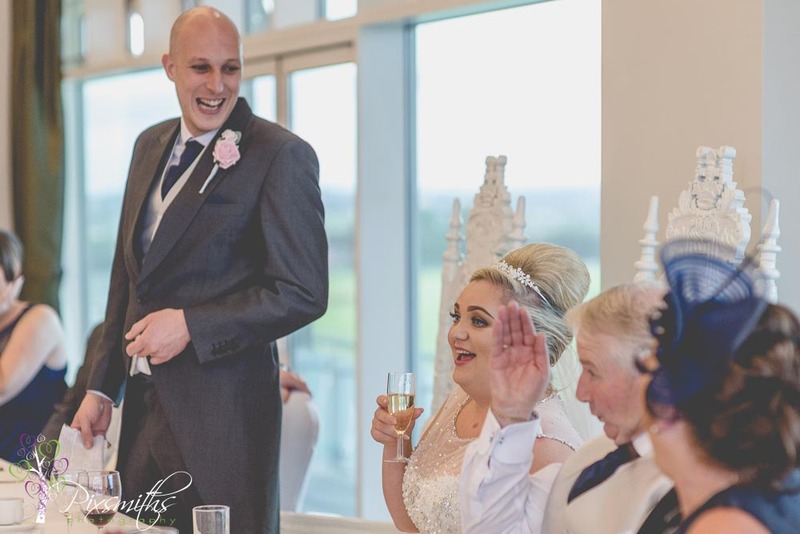 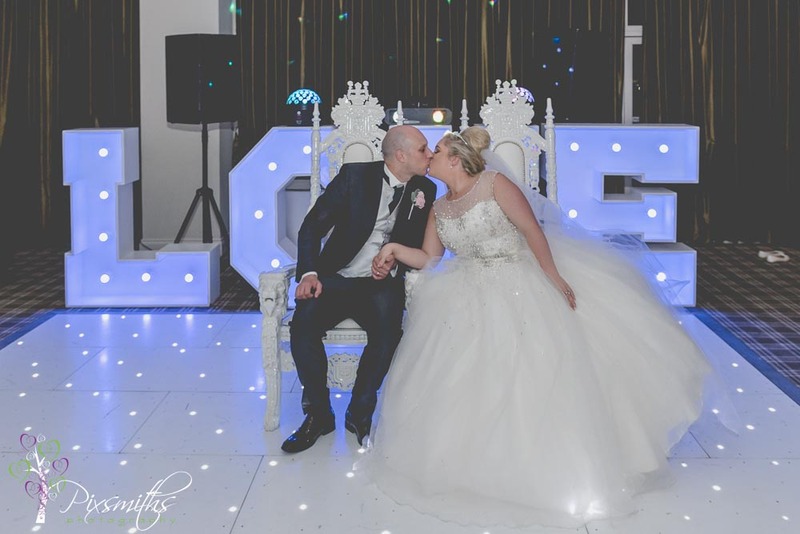 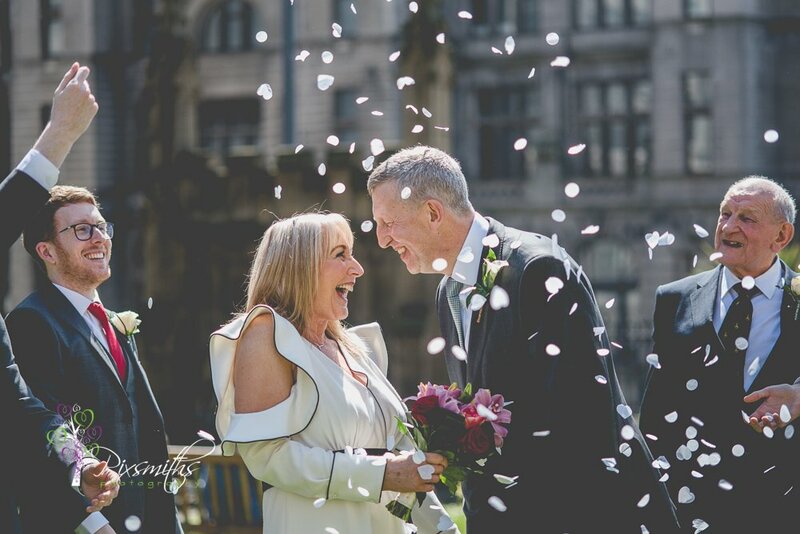 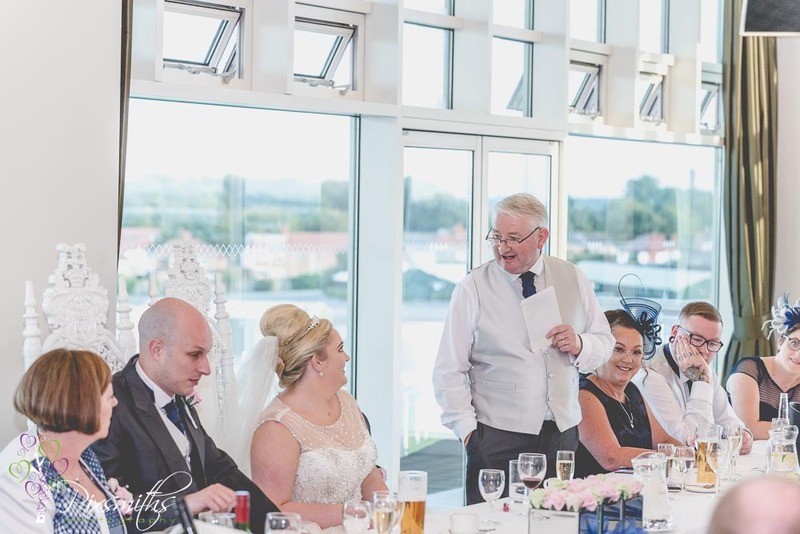 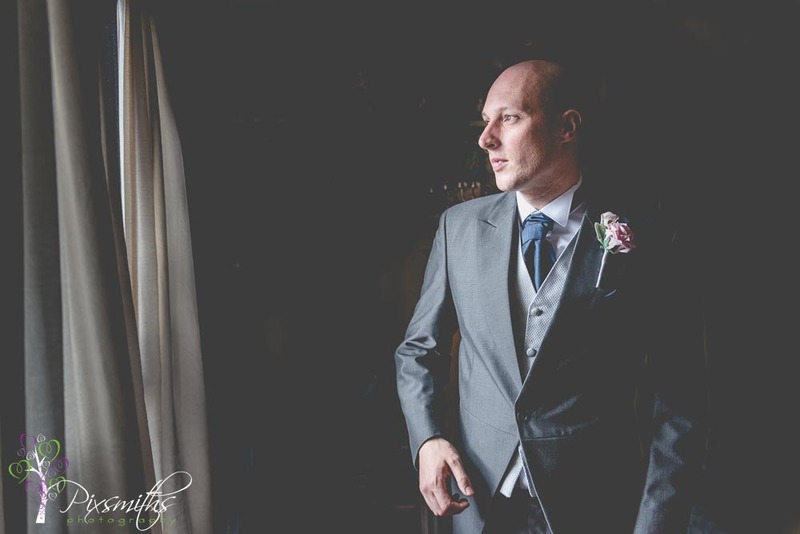 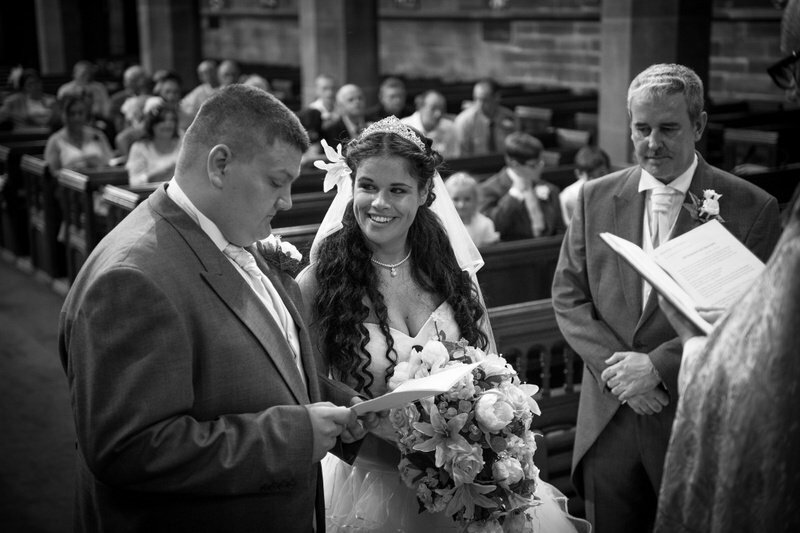 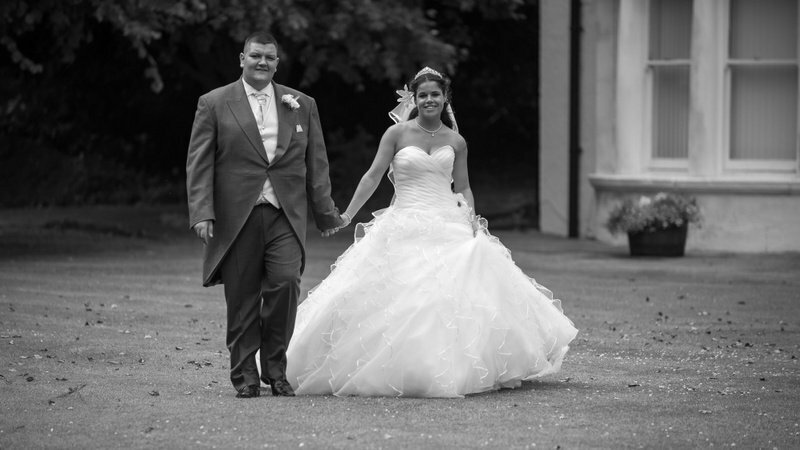 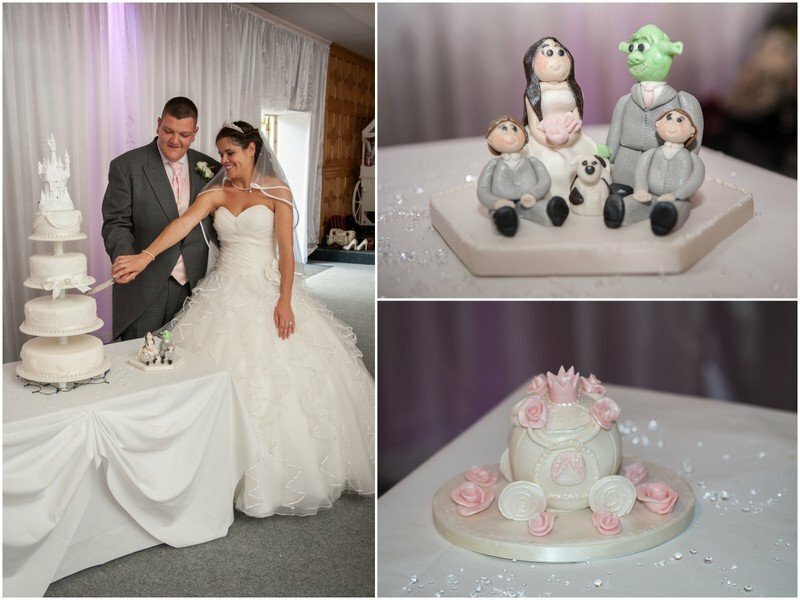 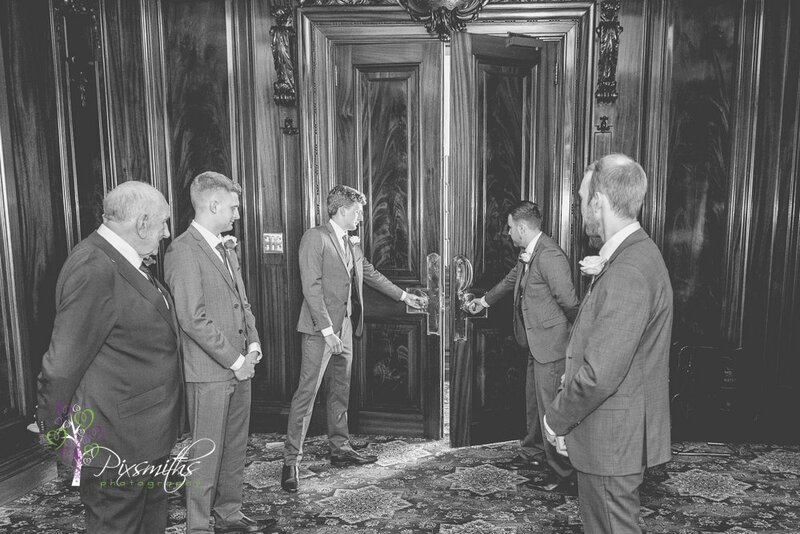 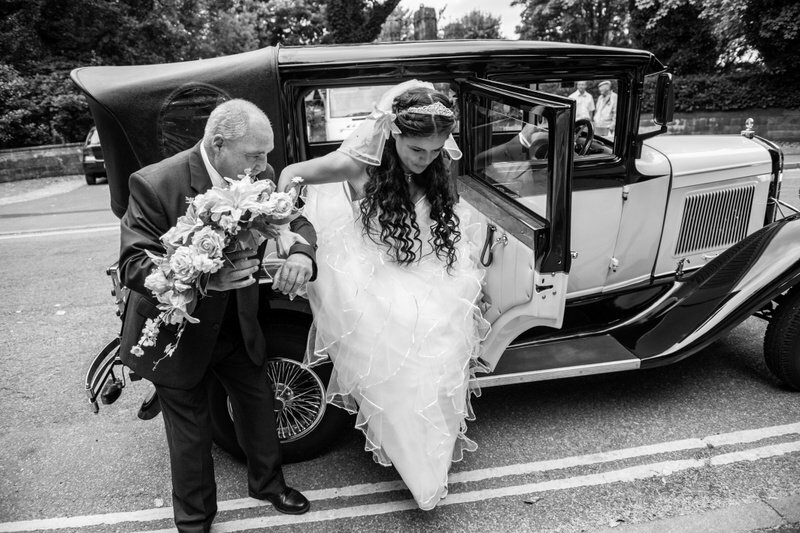 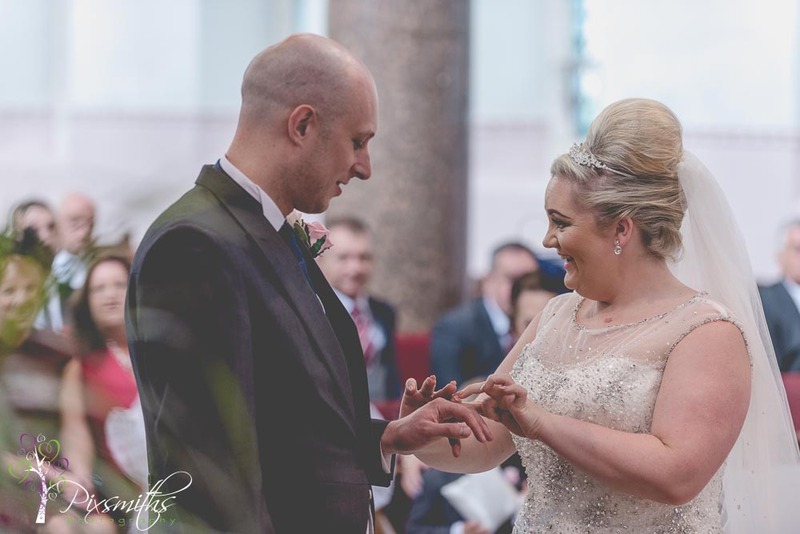 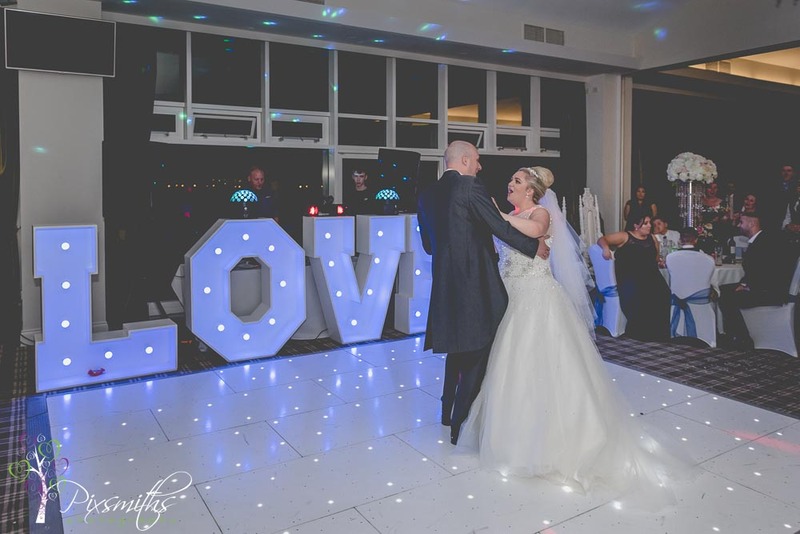 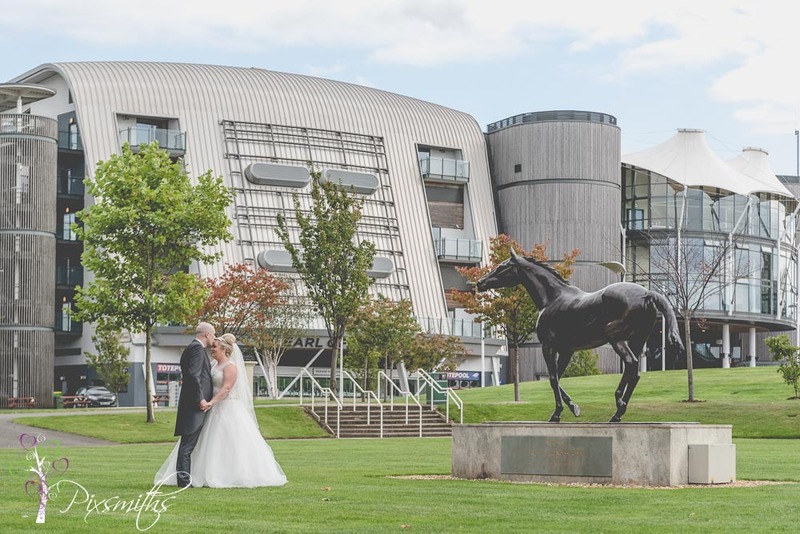 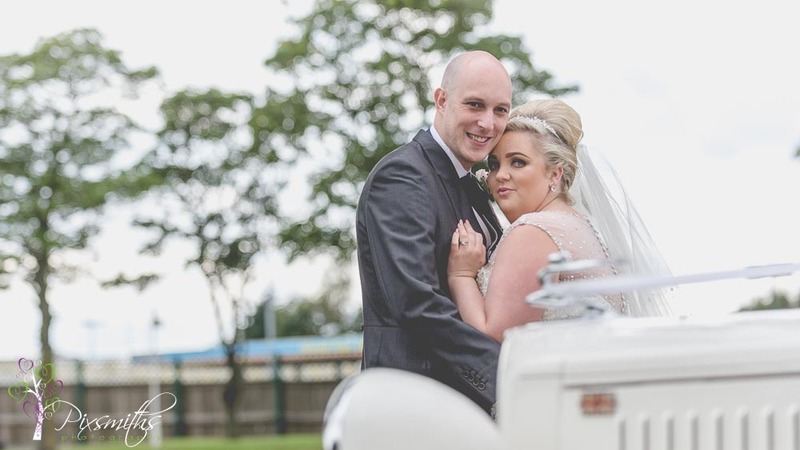 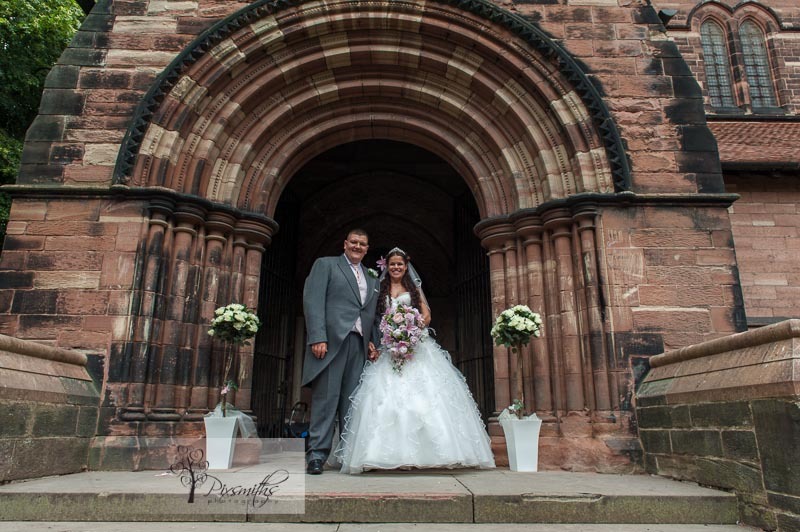 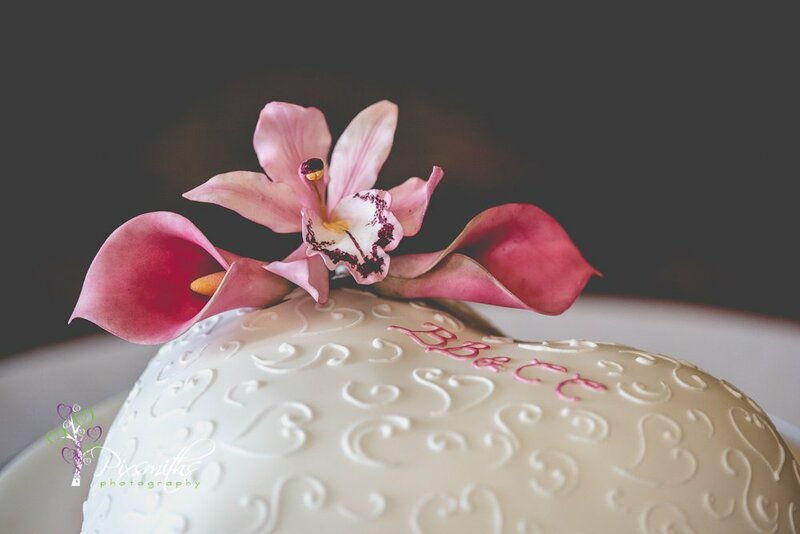 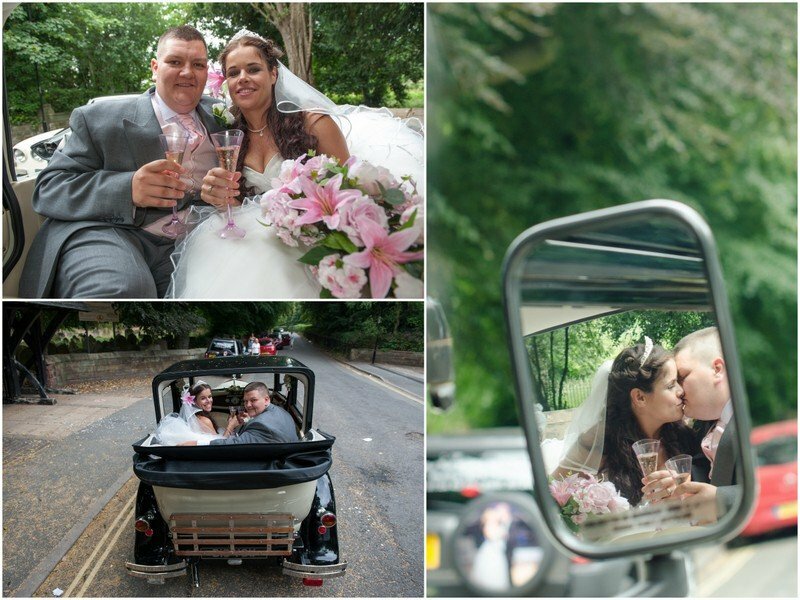 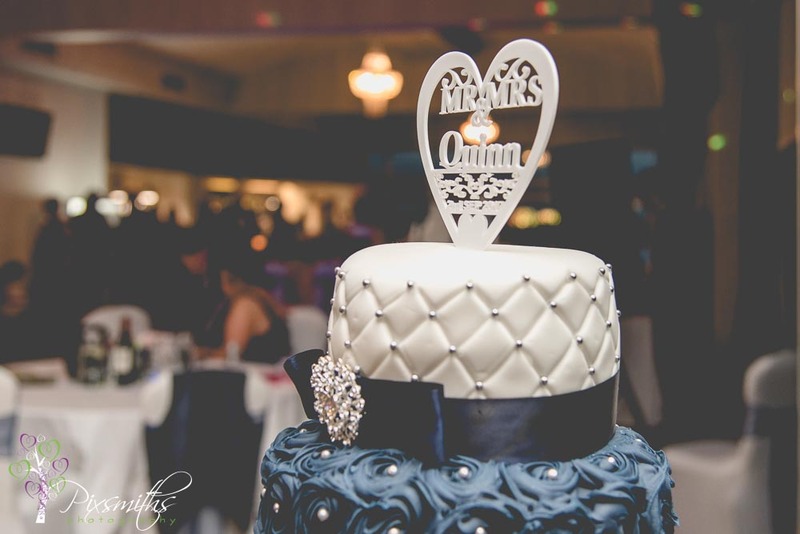 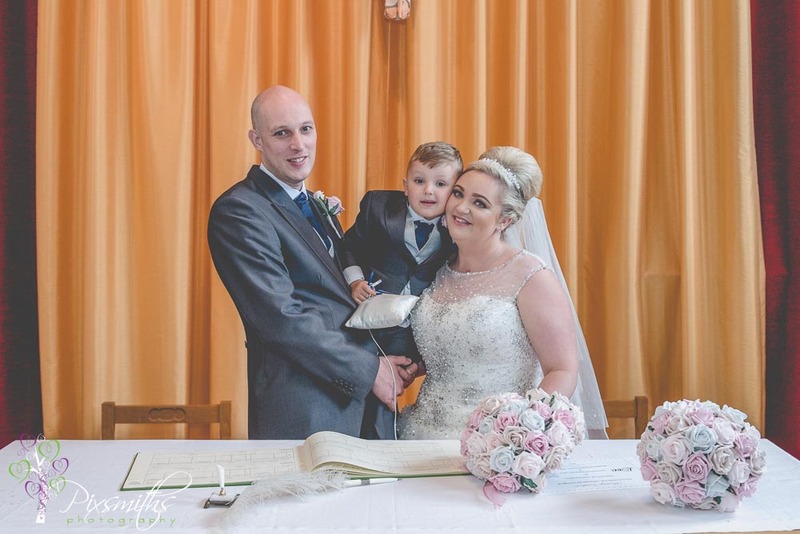 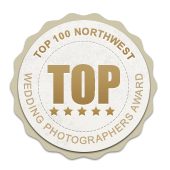 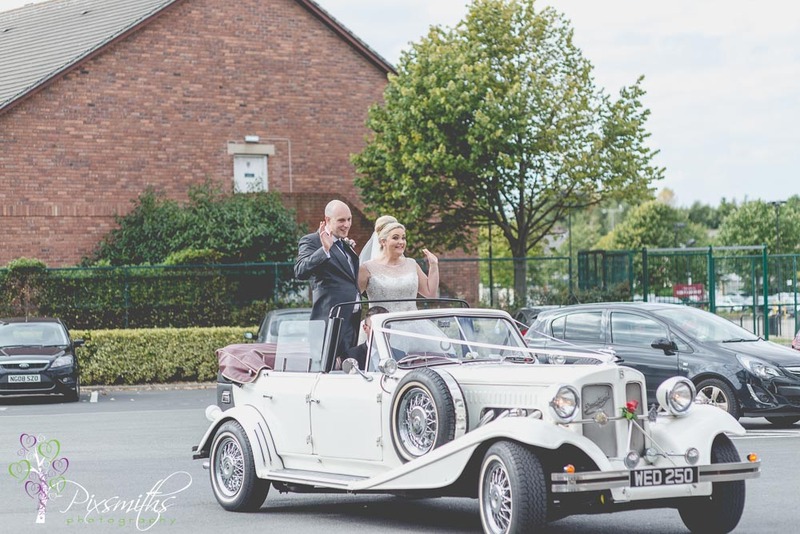 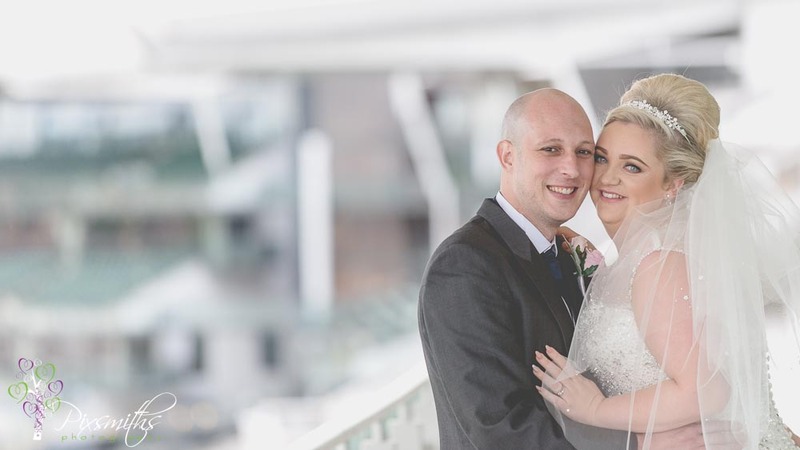 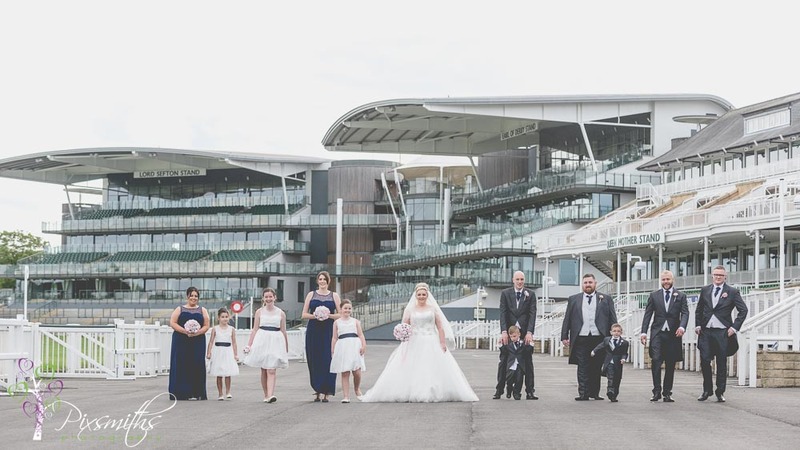 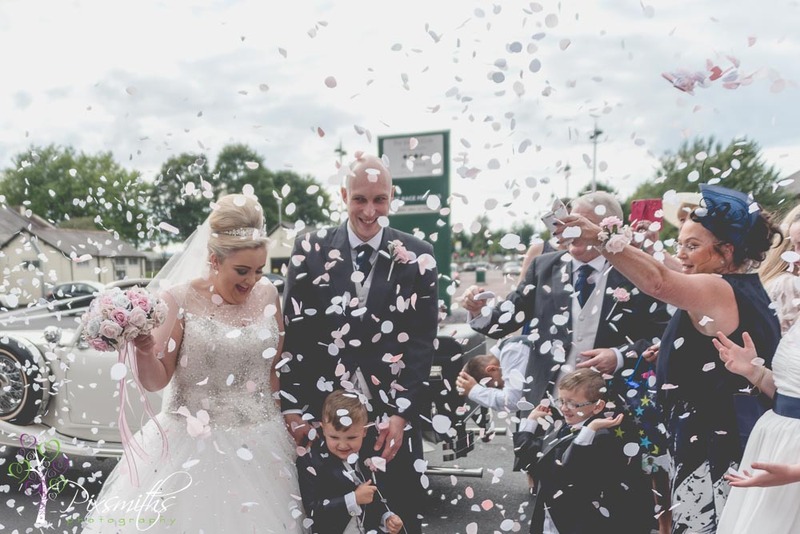 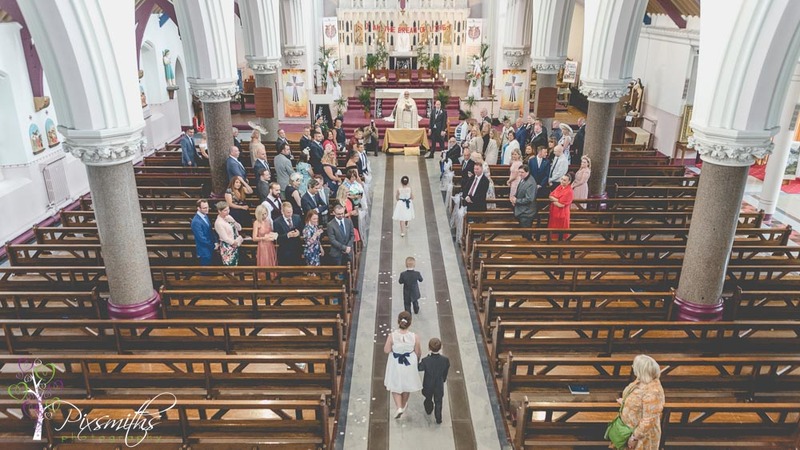 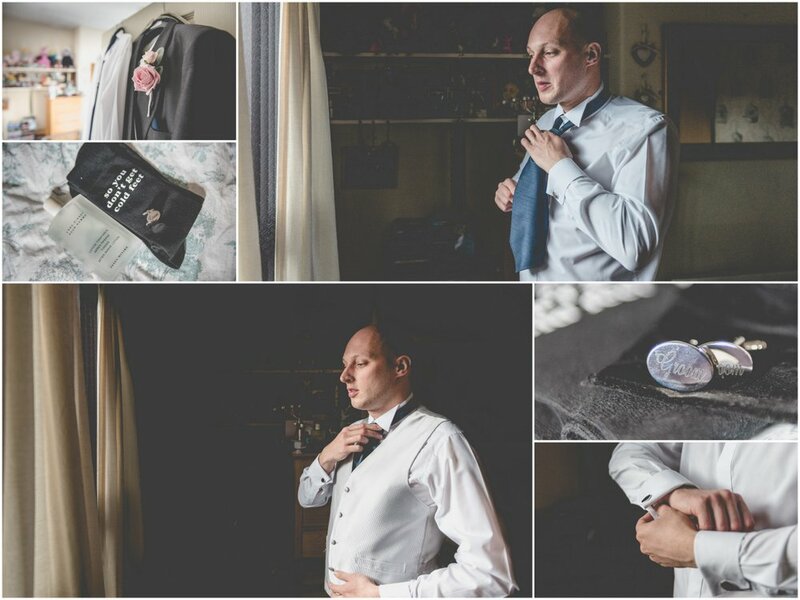 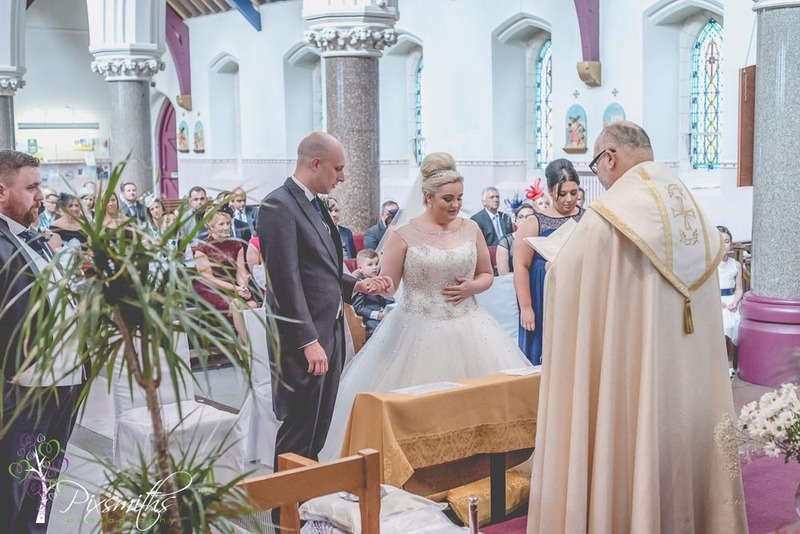 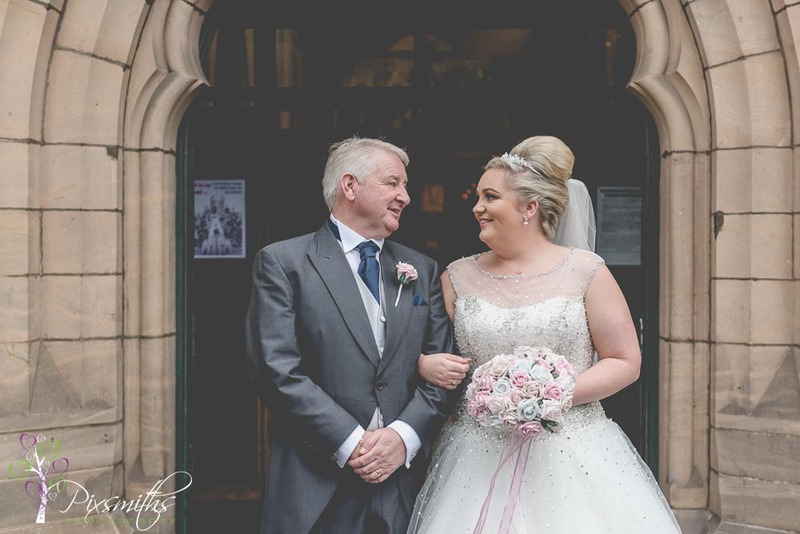 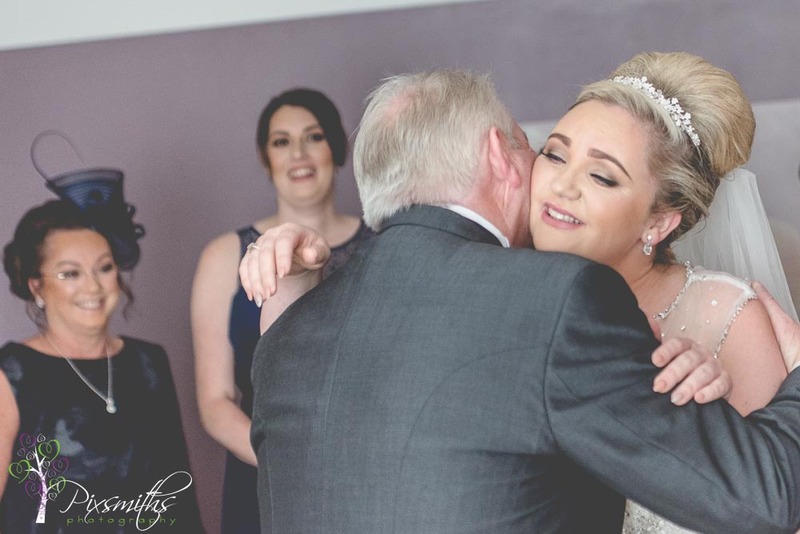 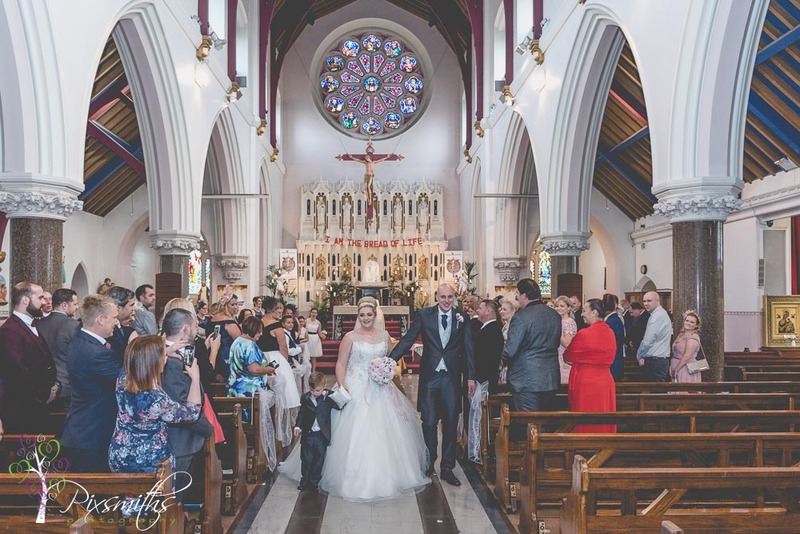 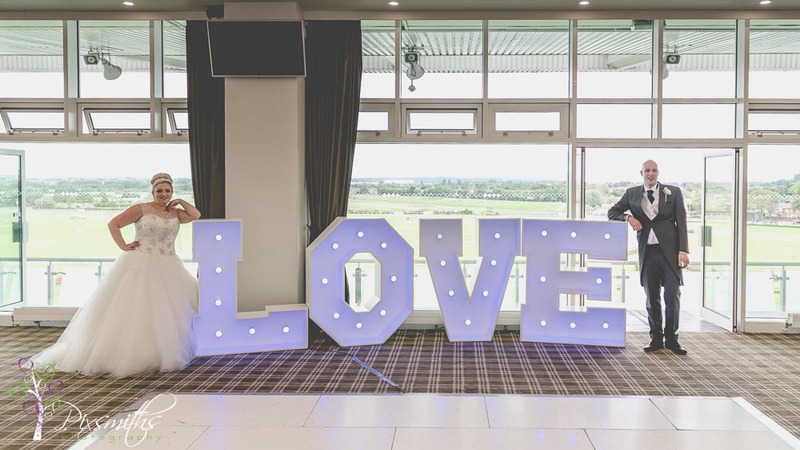 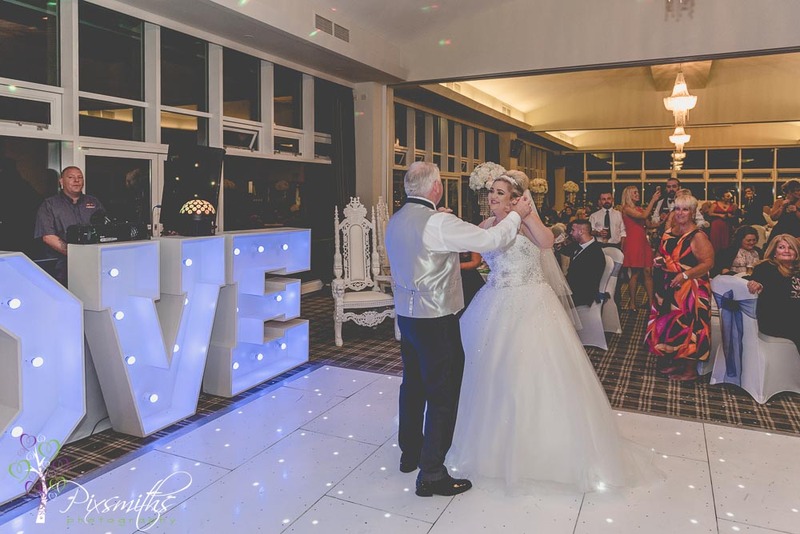 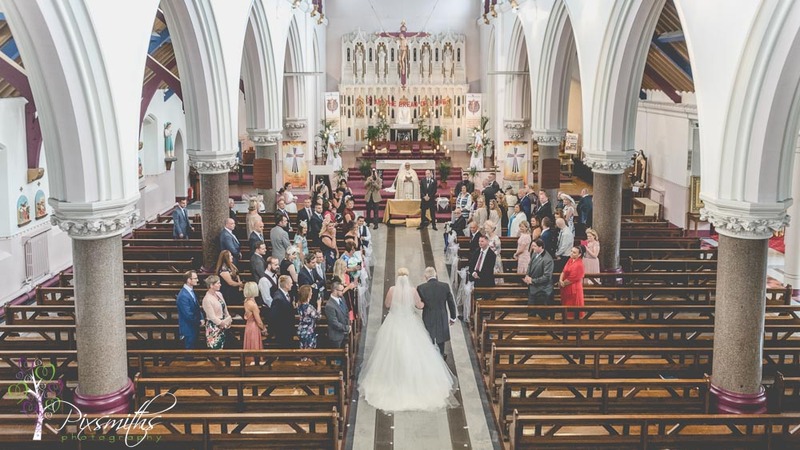 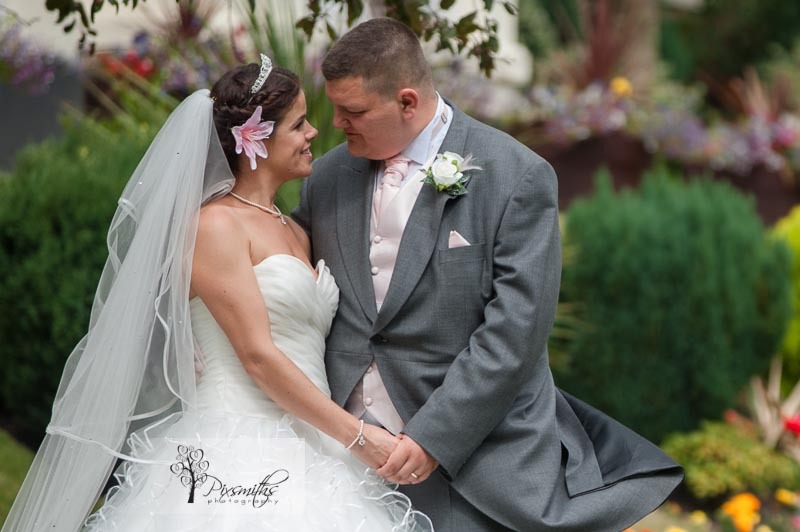 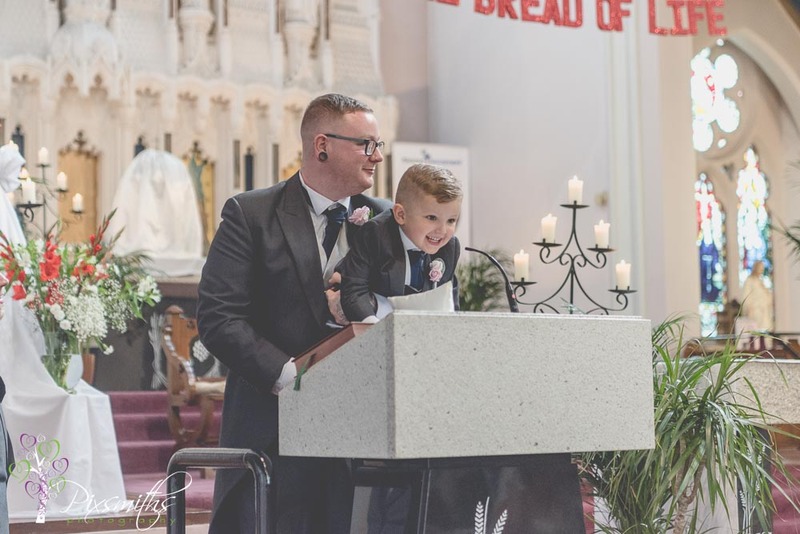 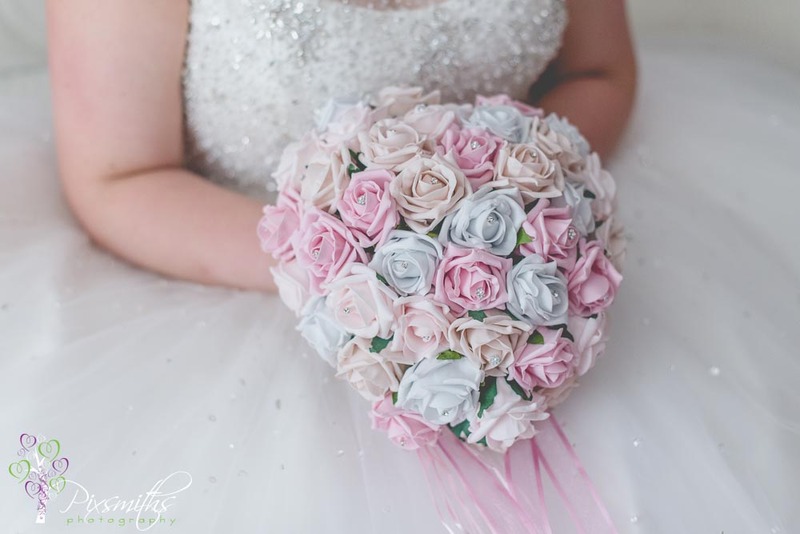 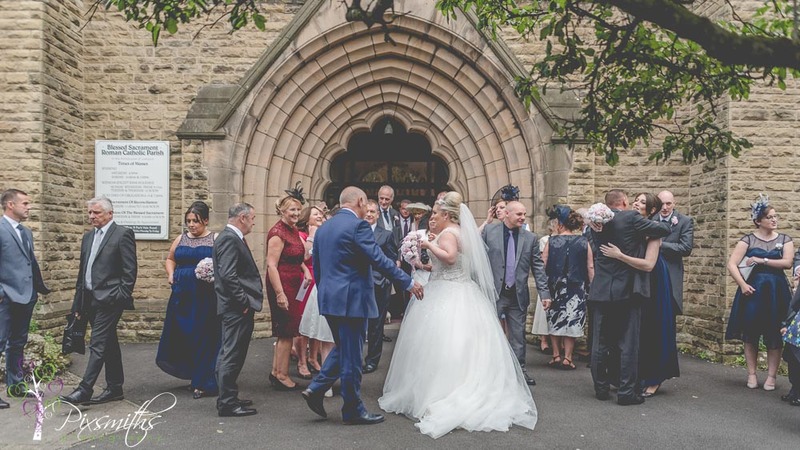 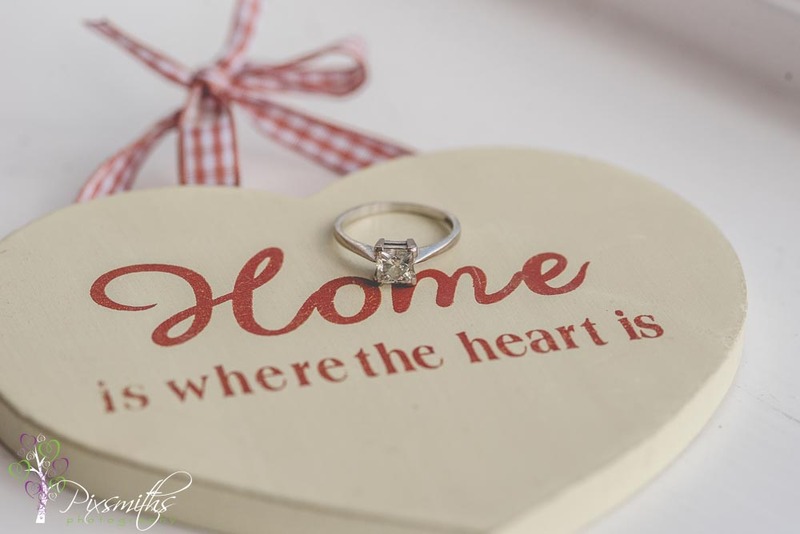 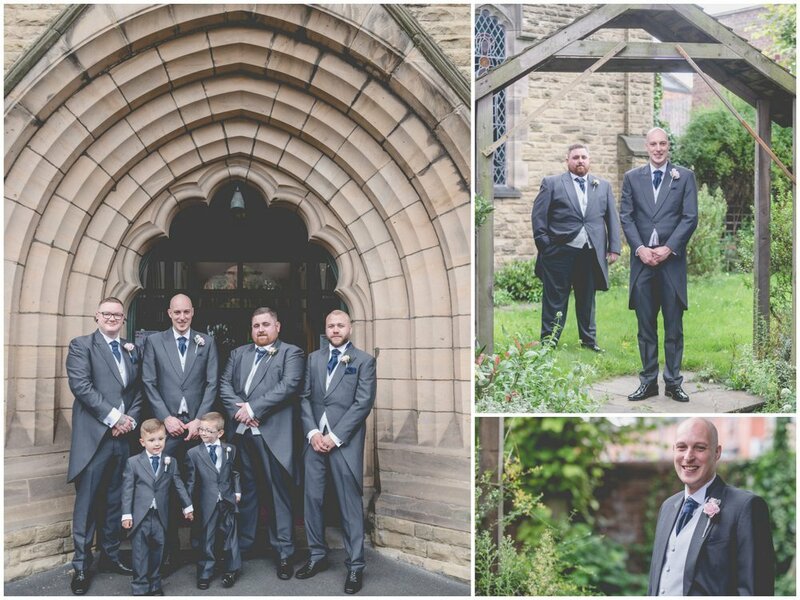 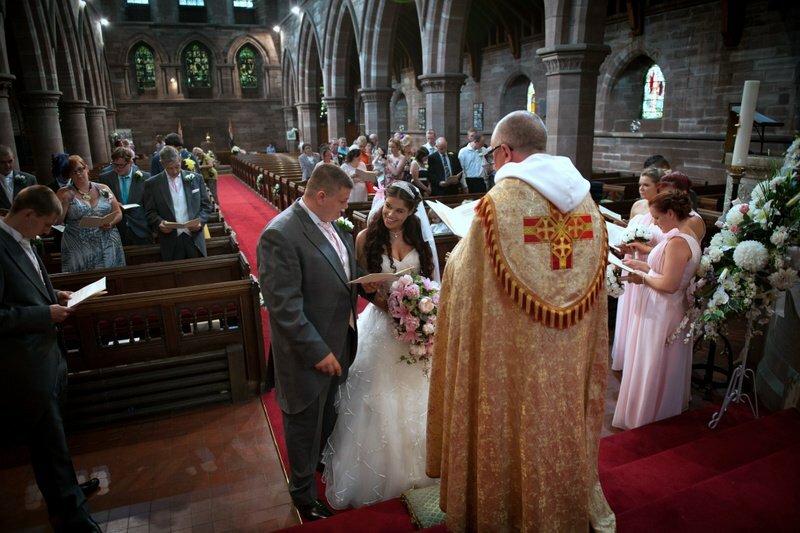 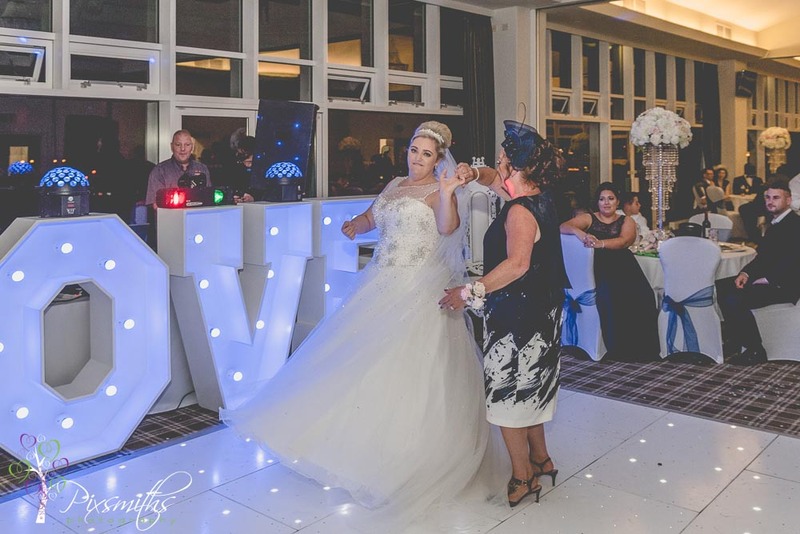 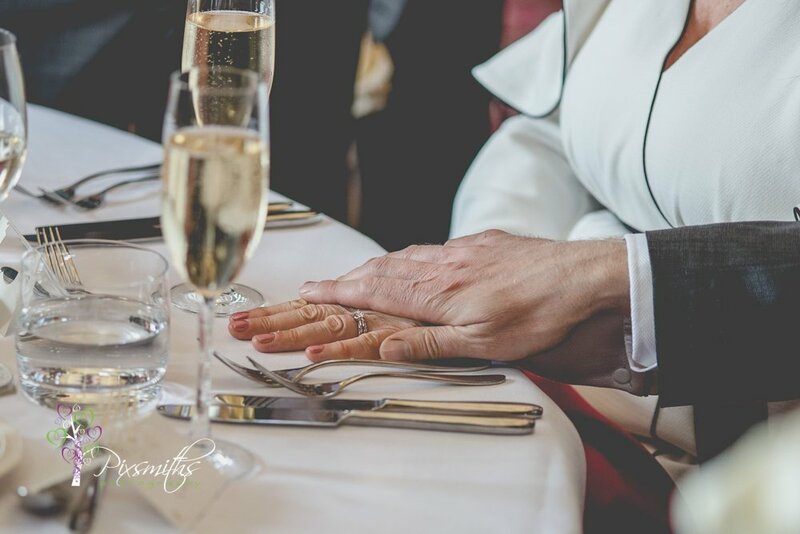 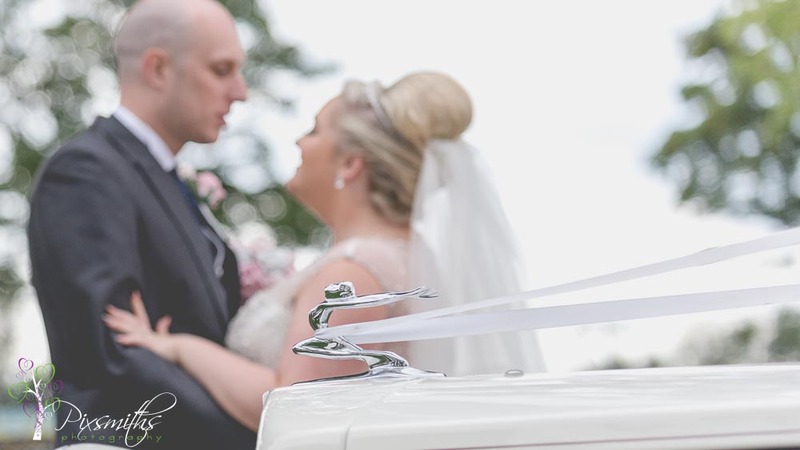 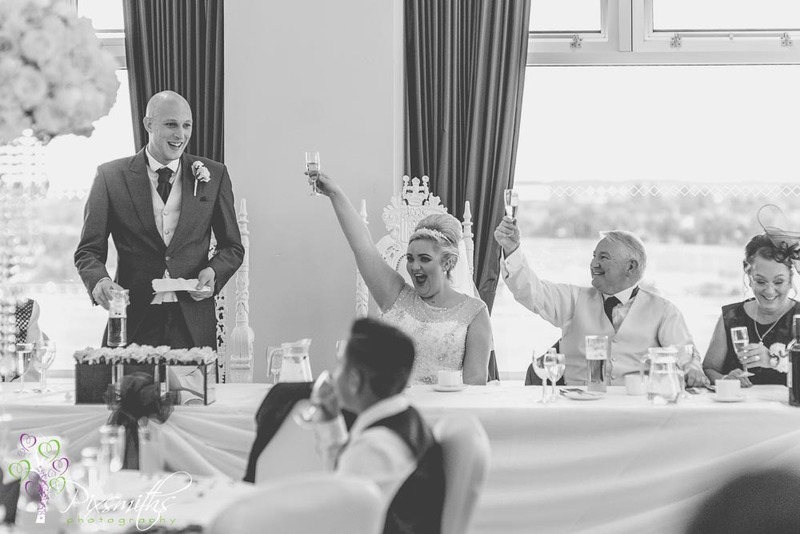 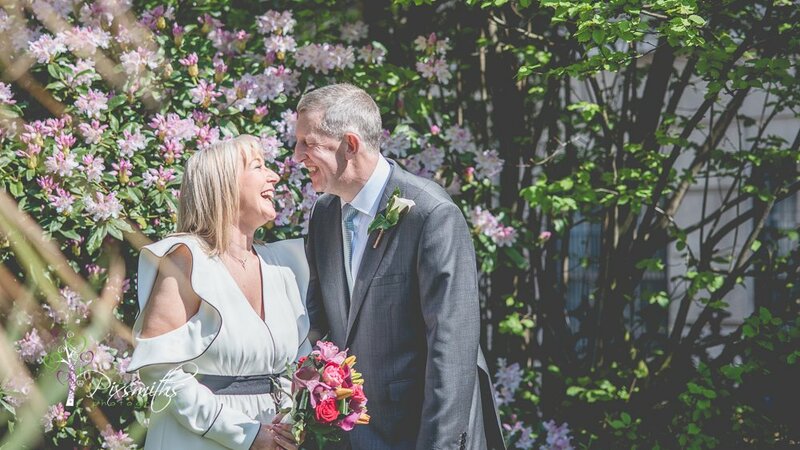 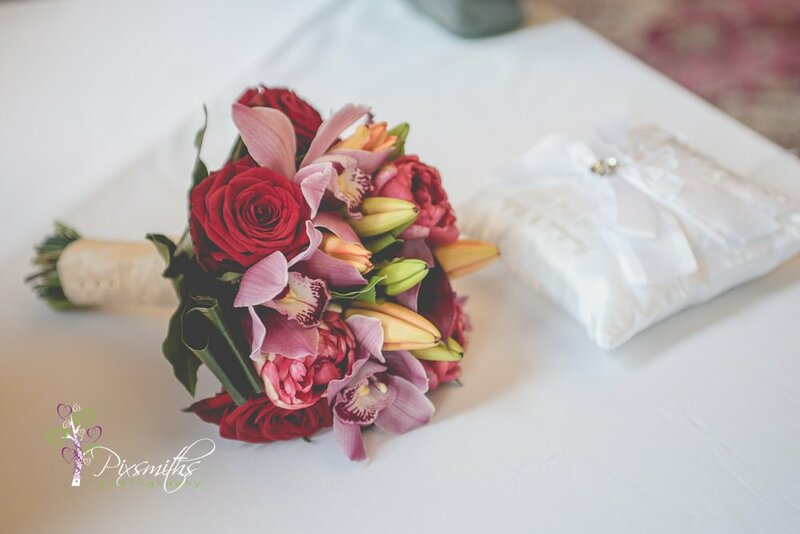 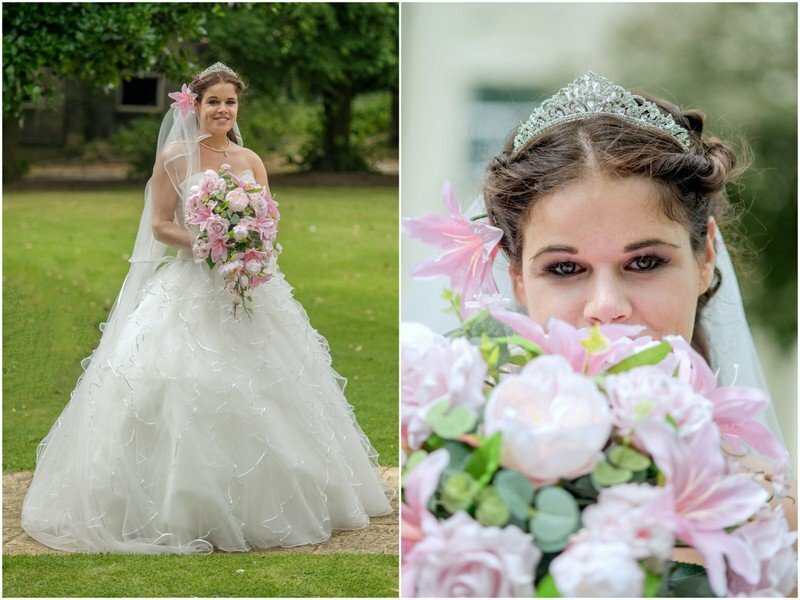 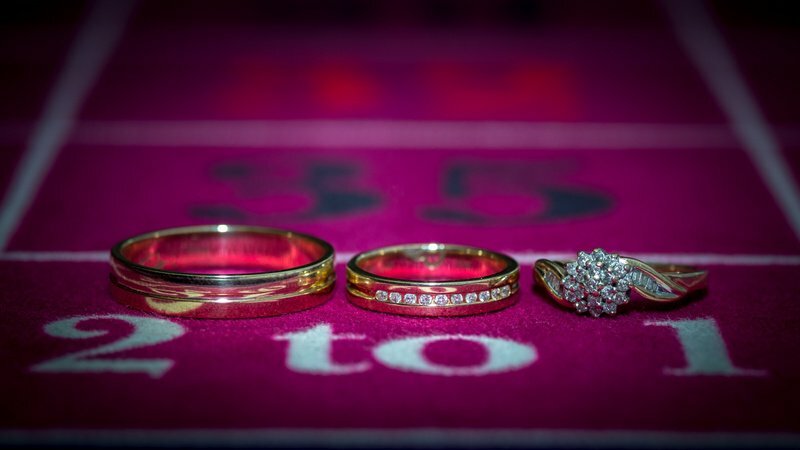 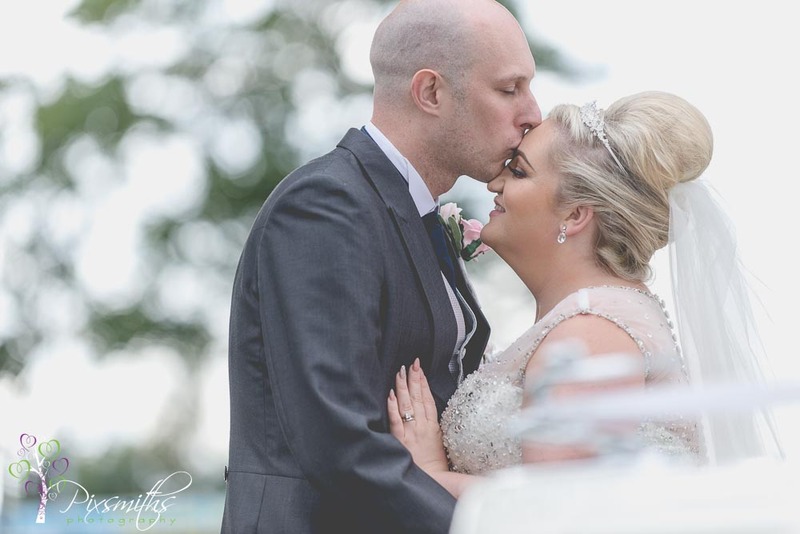 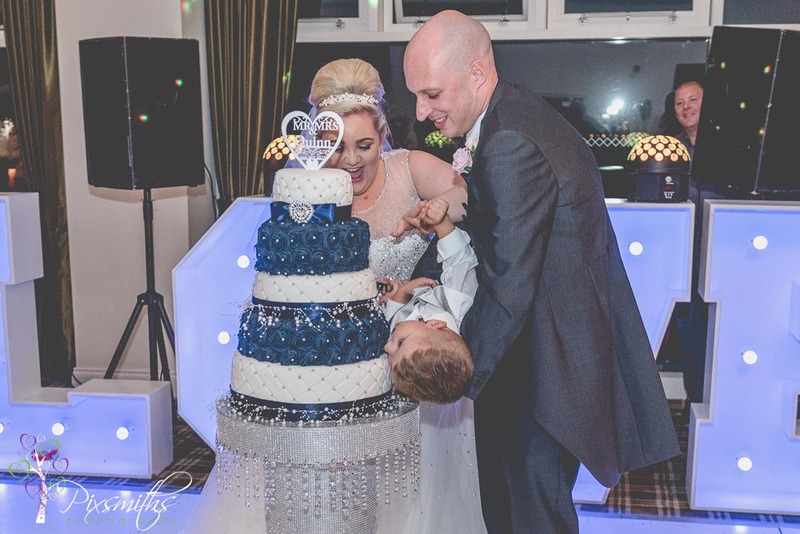 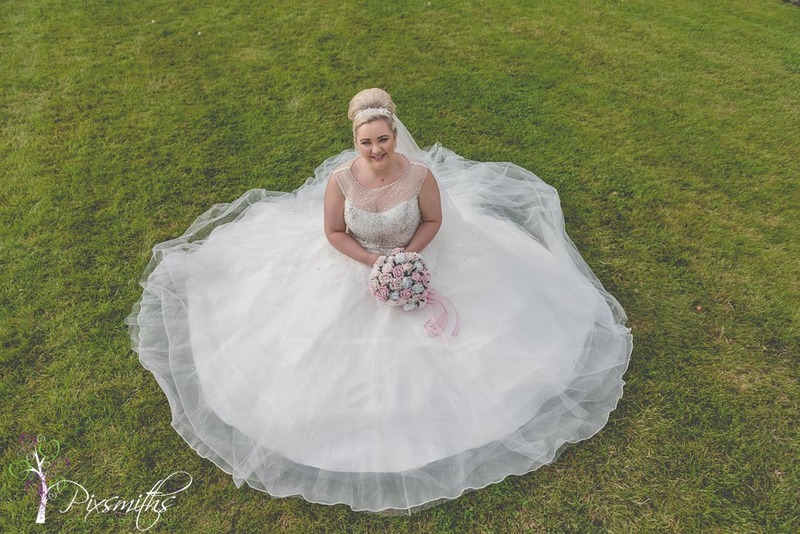 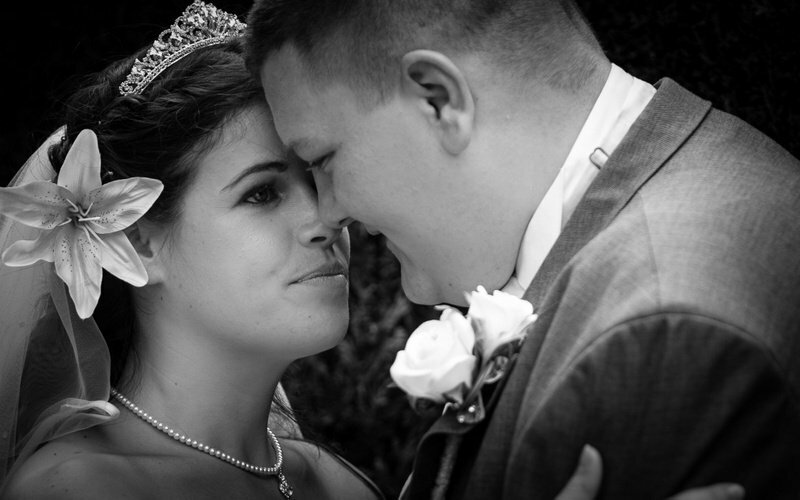 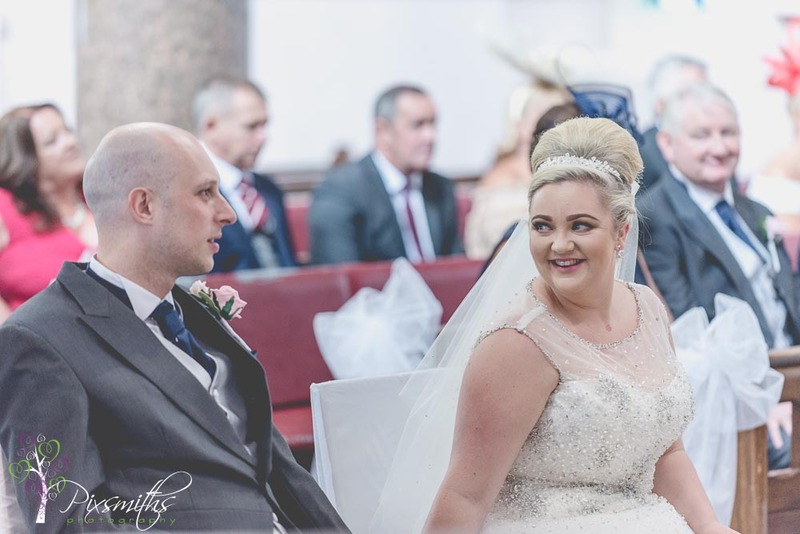 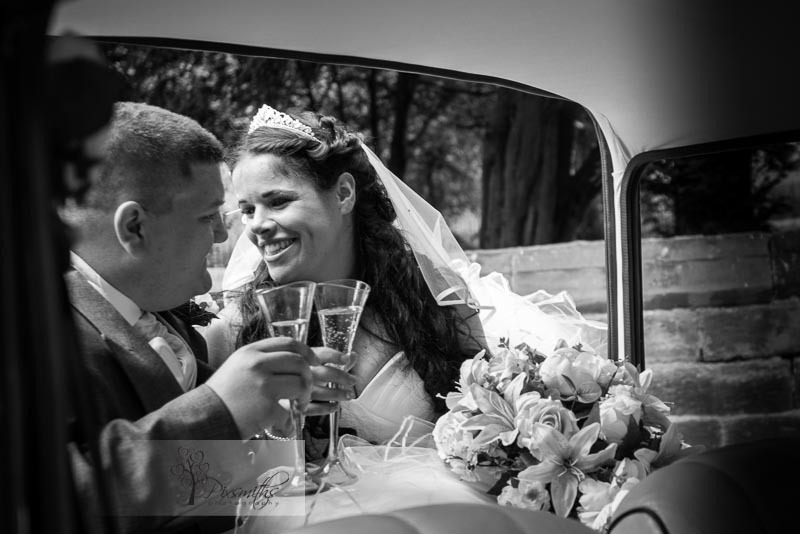 This was another wedding day that Pixsmiths Creative photography had been looking forward to – and many thanks to our referral network for this one, much appreciated. 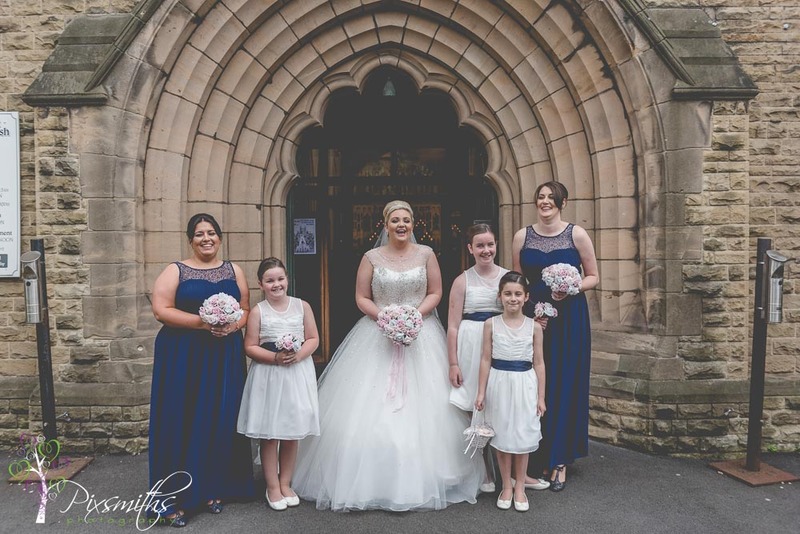 We crossed over from the Wirral where we are based to Liverpool and Kirkby to catch up with Jeanette as she prepared for the day ahead with her girls. 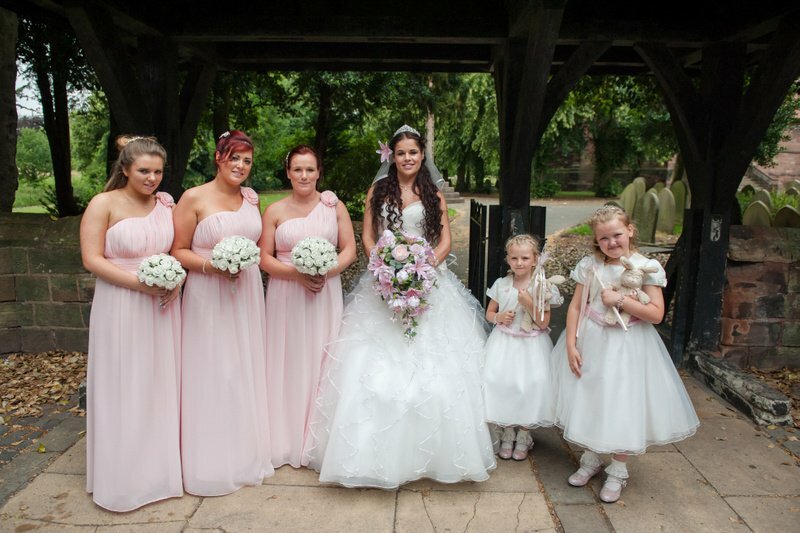 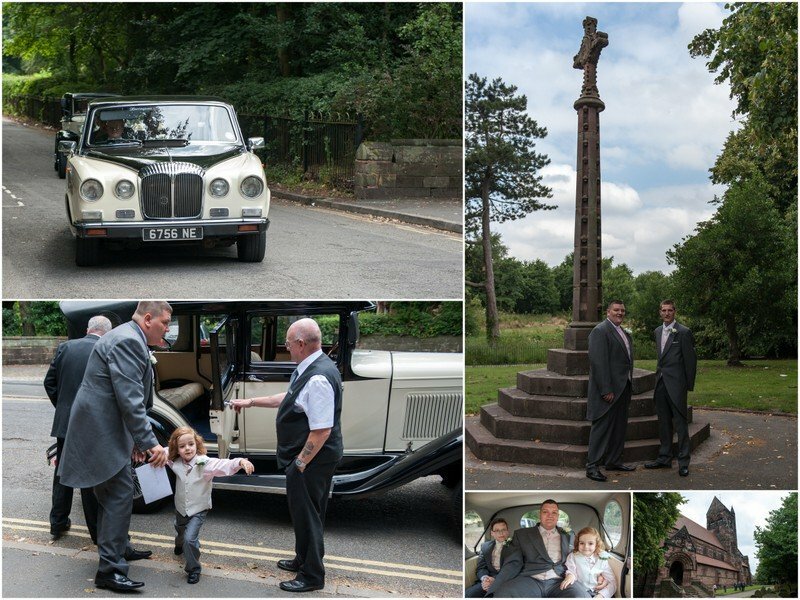 Things were overrunning, but no problem Sandy could stay with the girls whilst Dave went on ahead to get men shots before the ceremony at St Chads, a lovely church. 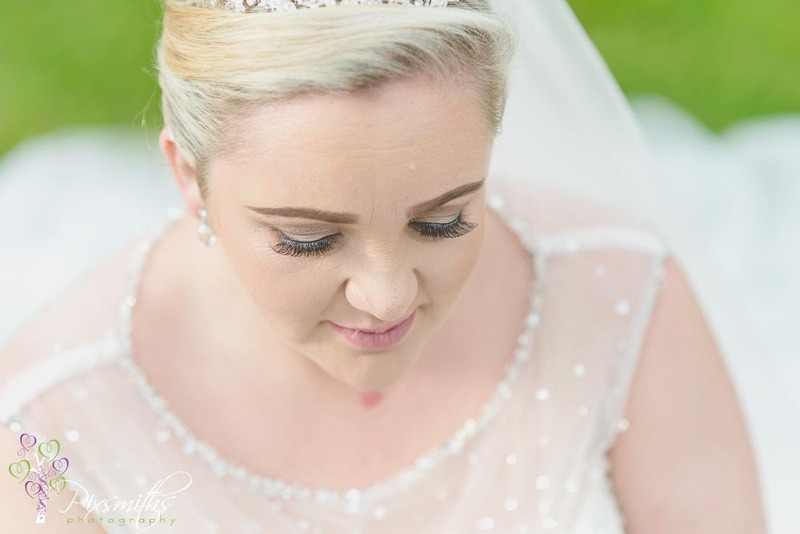 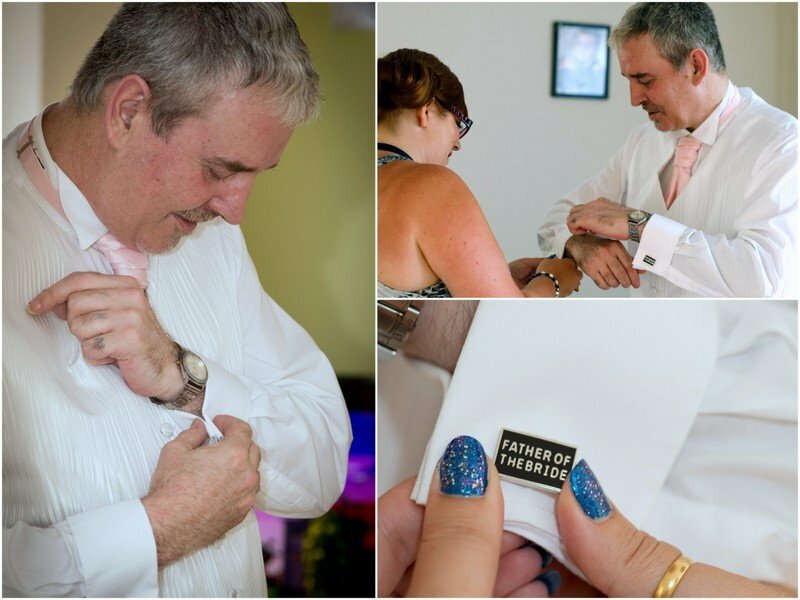 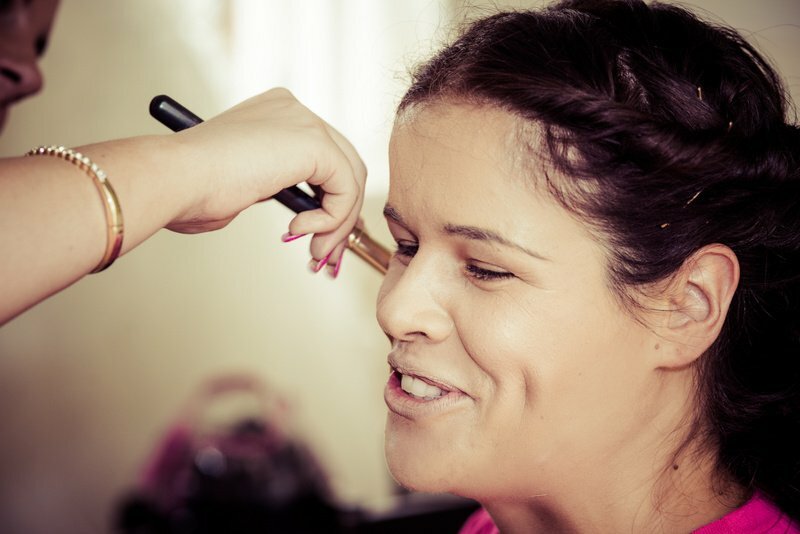 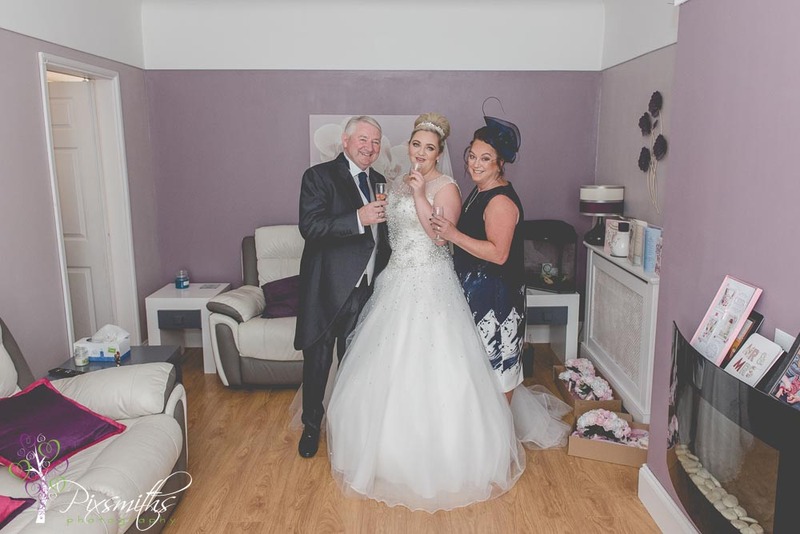 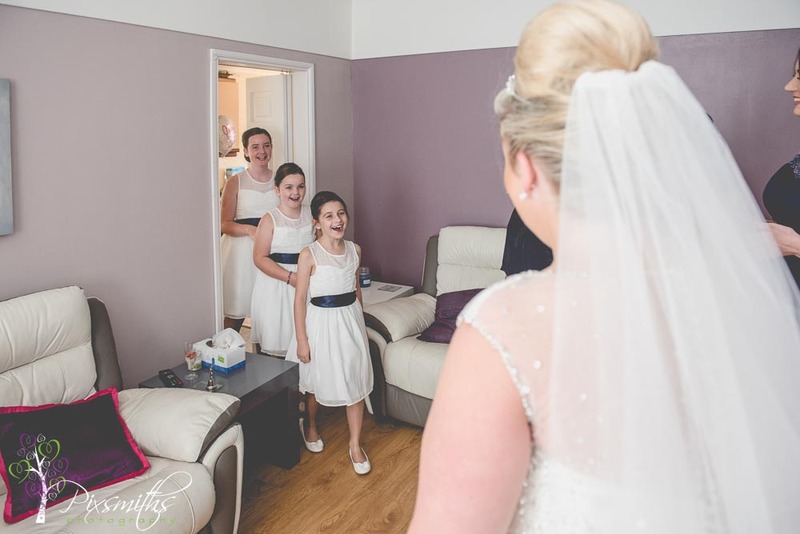 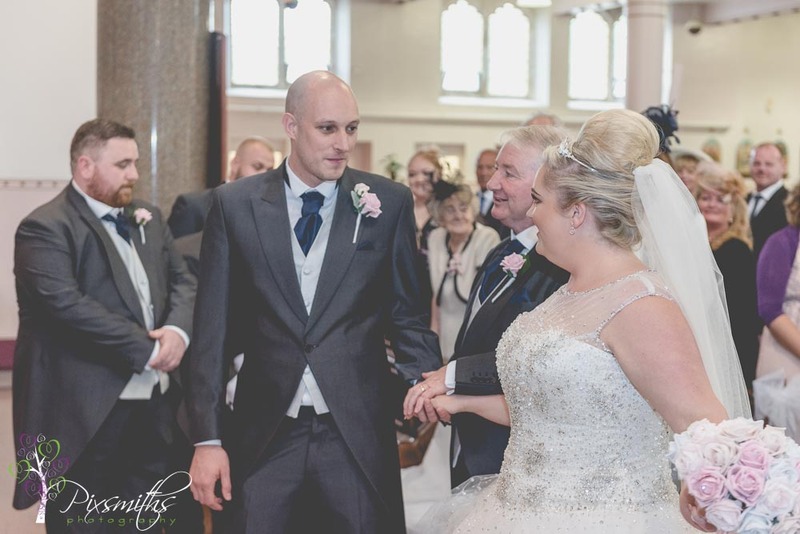 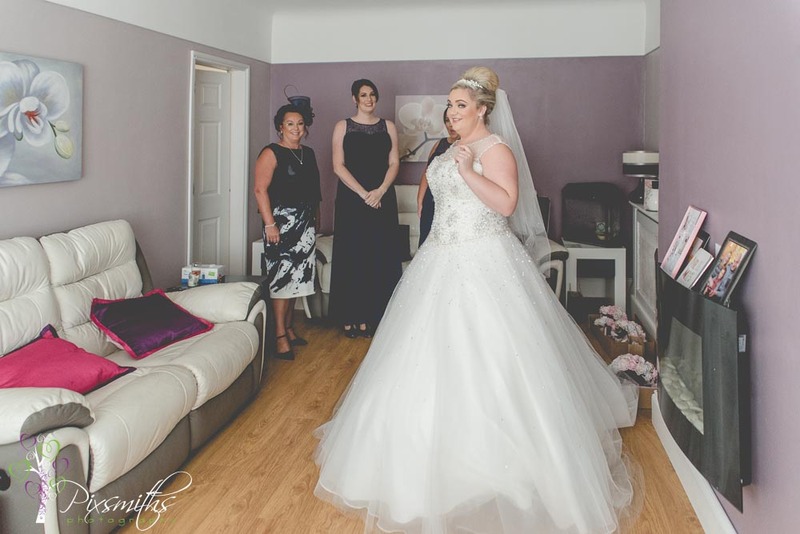 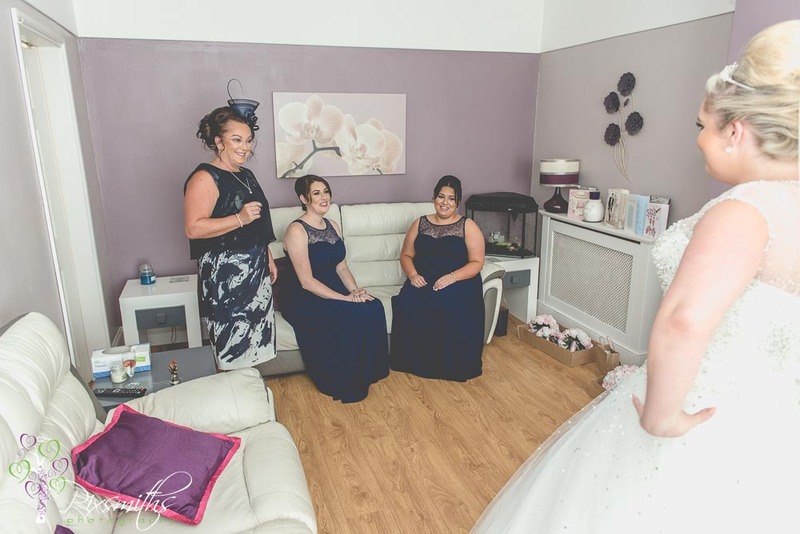 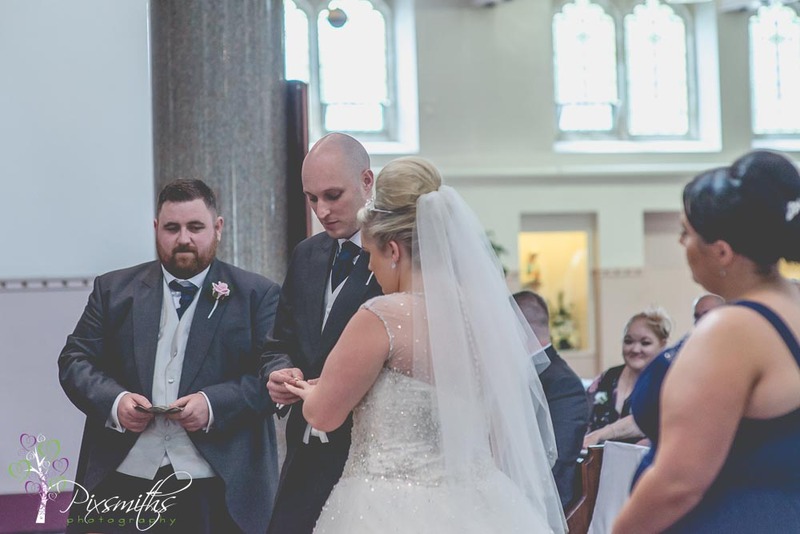 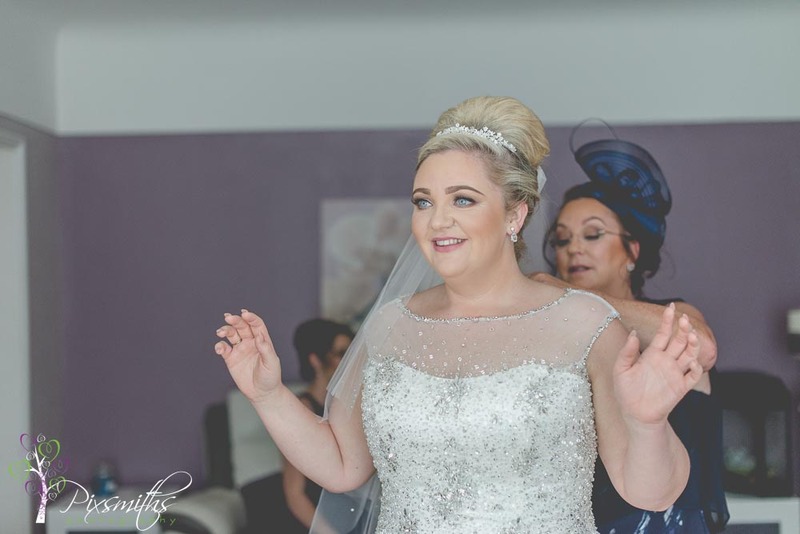 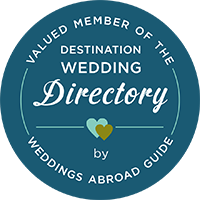 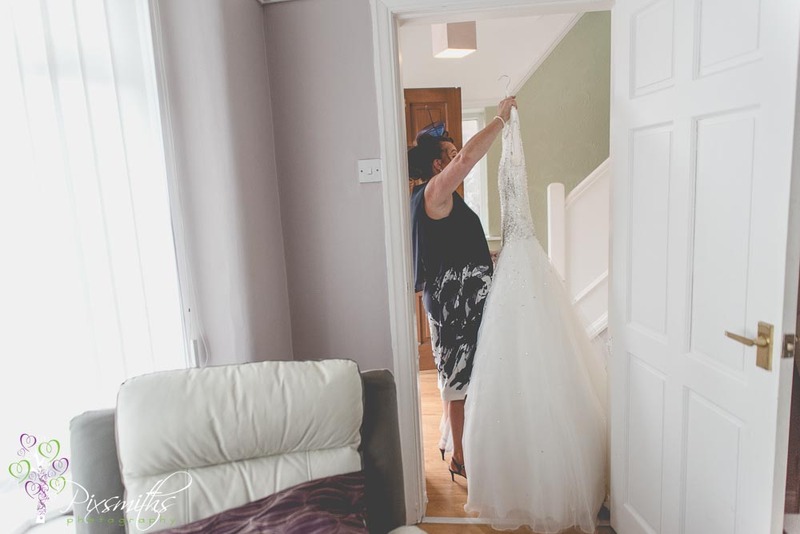 Jeanette was traditionally late – a good 30 minutes but we soon put her waiting groom at ease with how things were progressing at the bridal preps! 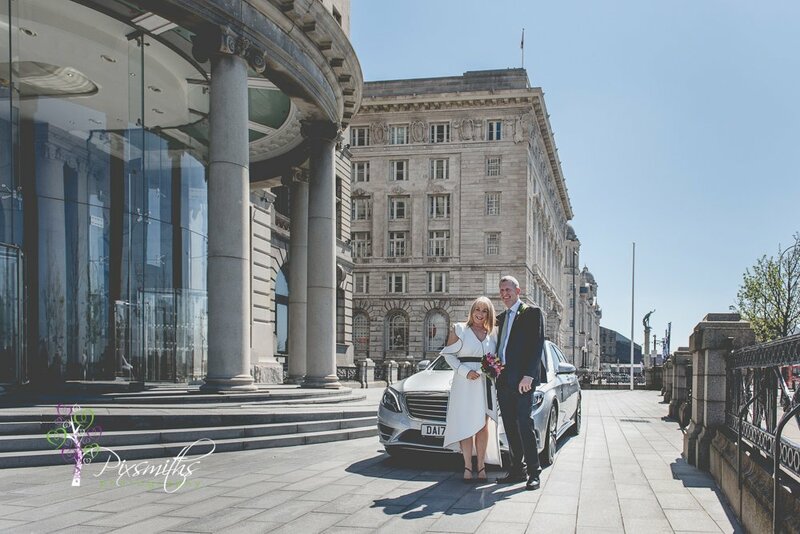 Family shots here and then as time was fast rushing by the couple were being whisked off to Devonshire House in luxurious Barrington wedding cars. 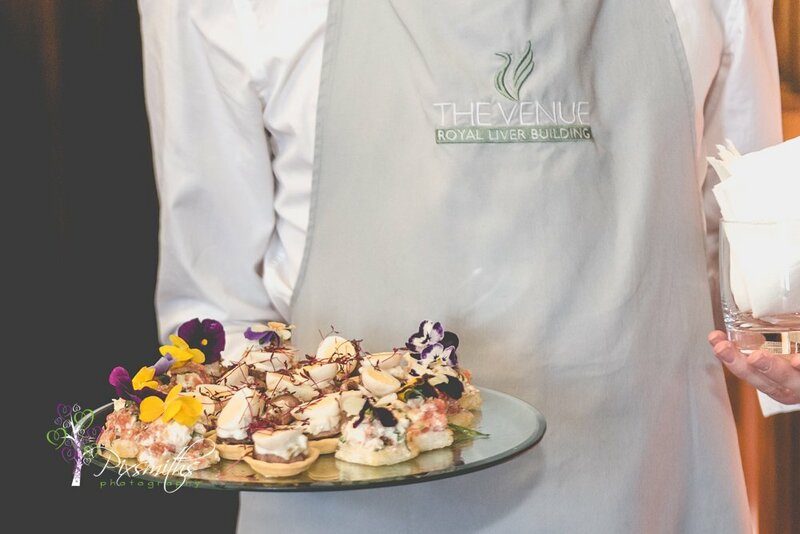 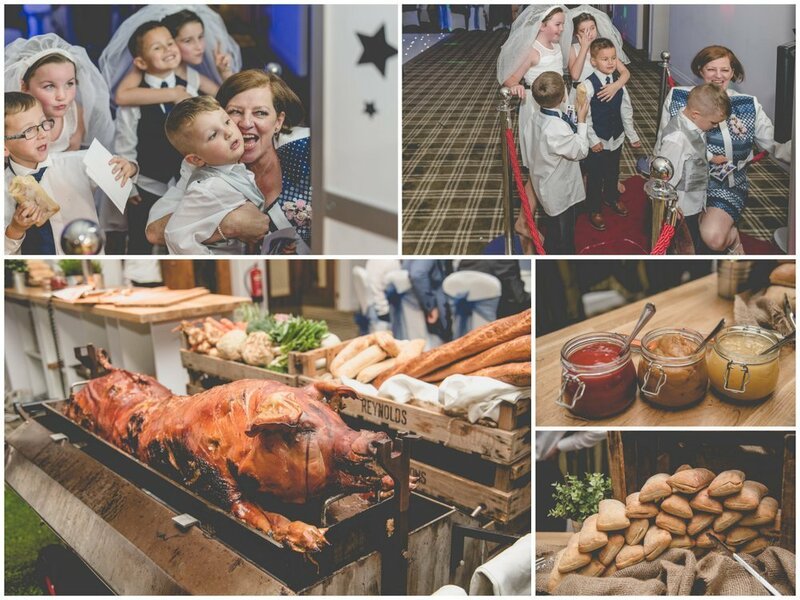 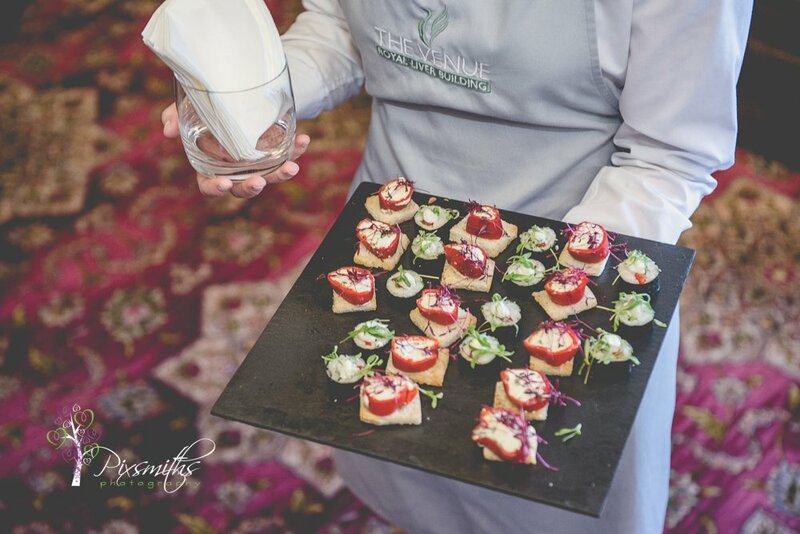 Time for some bride and groom shots – thank you to Devonshire House for giving us some time and also for providing us with food – much appreciated. 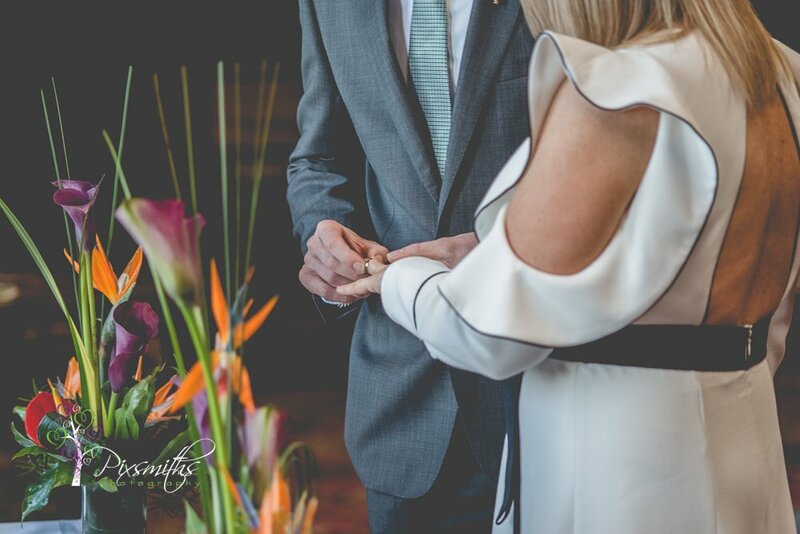 Speeches done and then we could get one of our signature ring shots we love to do before sadly leaving the party to enjoy their evening festivities. 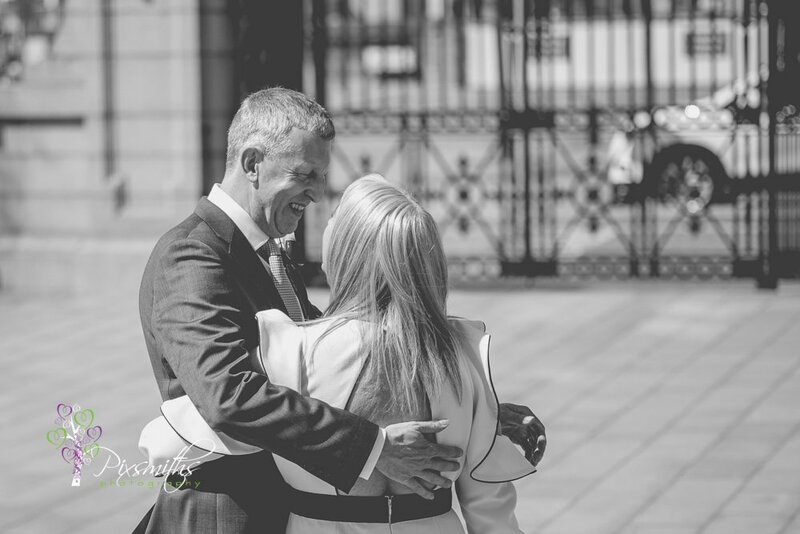 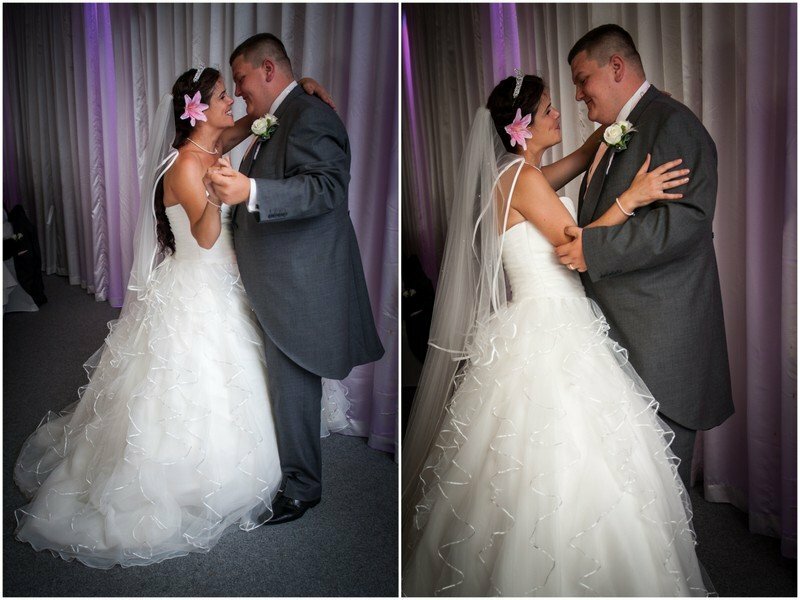 Many congratulations to Jeanette and Michael, such a devoted couple, we so enjoyed capturing all the loving looks between them. 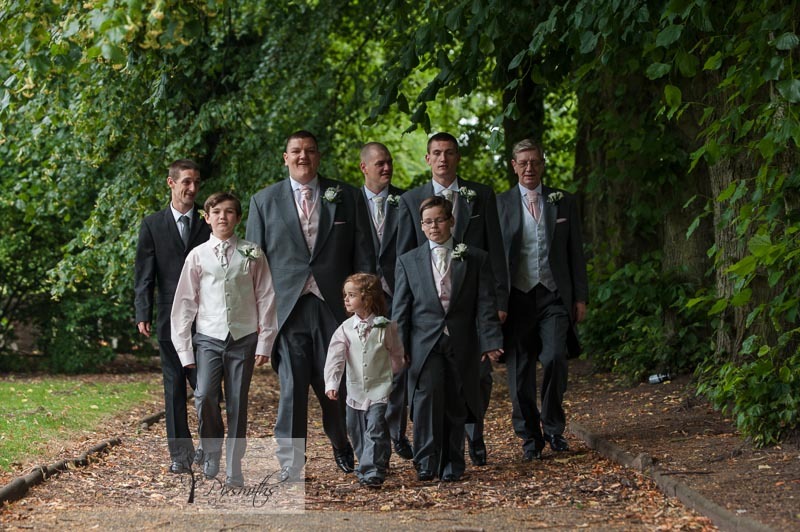 So deserved after all the struggles their family have been through, especially with Alex their younger son. 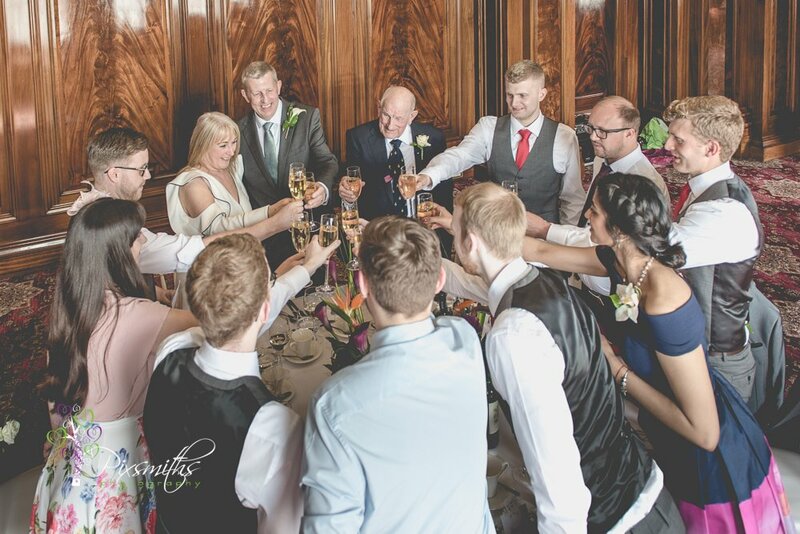 Fantastic to see Alex here and doing so well, such a priviledge to be here with this loving family. 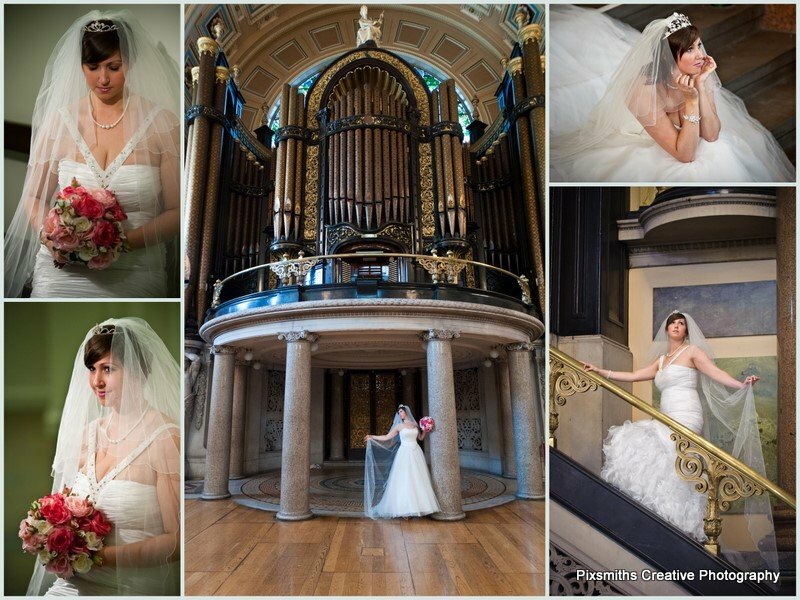 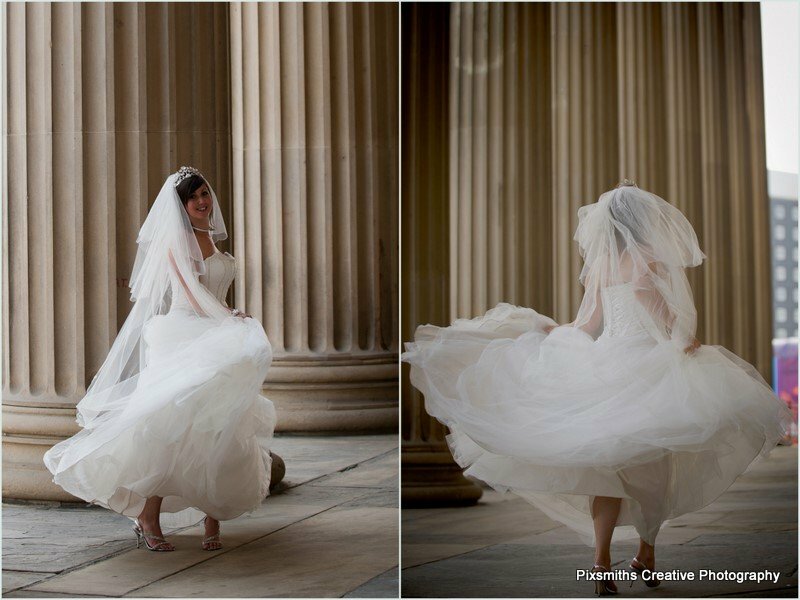 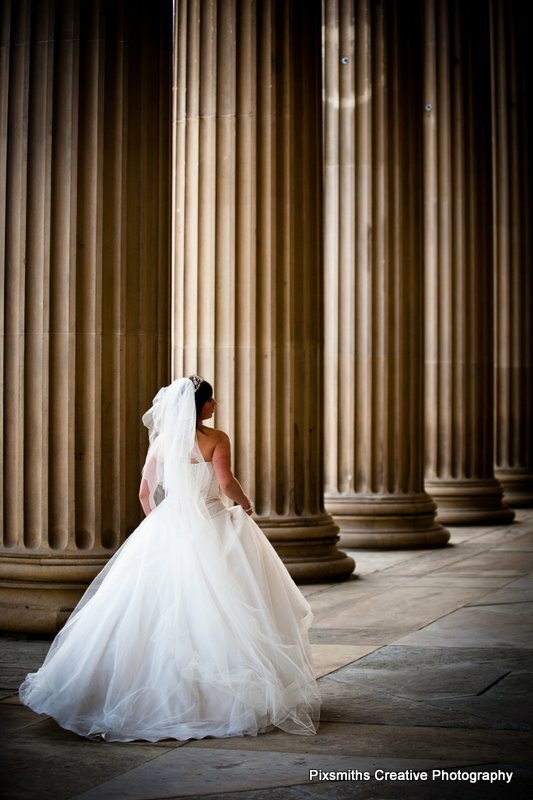 Time at last to catch up with a bridal shoot that that took place last Autumn in Liverpool at the fabulous St George’s Hall. 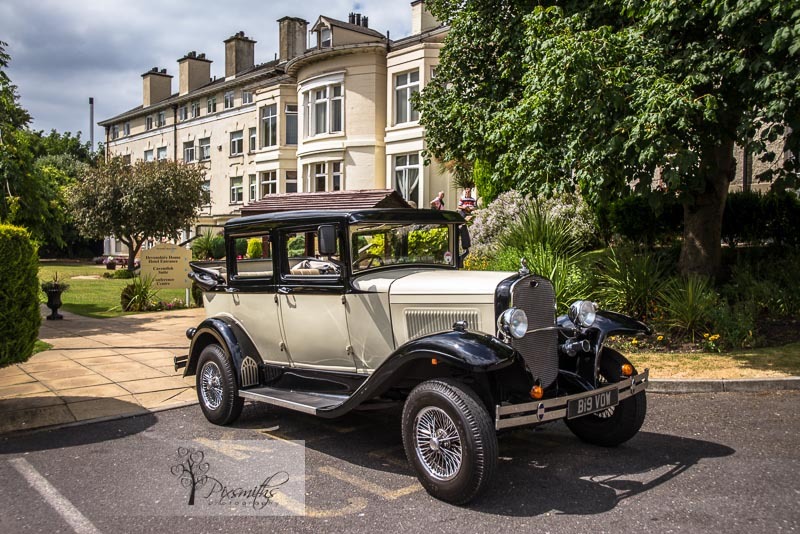 The event was led by Pete Bistro of Fotoinspir3 who organises several such events throughout the year at various locations with stunning architecture. 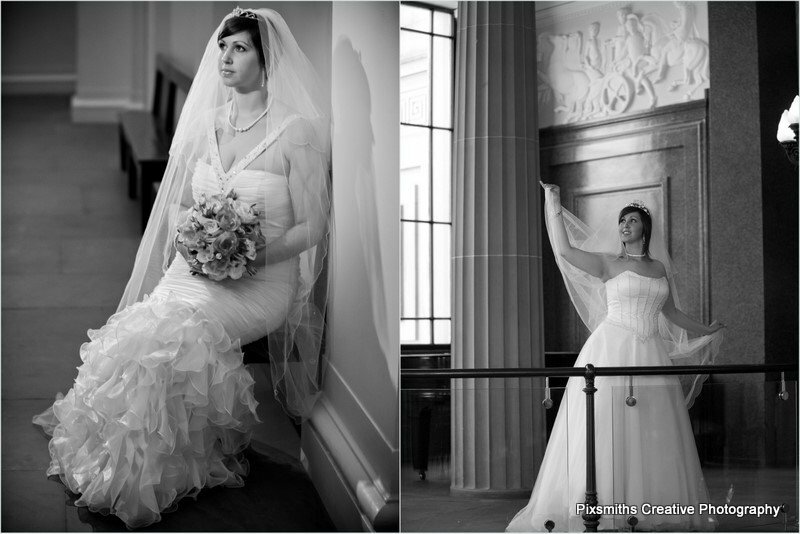 Pete was Classical Wedding Photographer of the Year in 2011 so it was a great opportunity to learn some new techniques – both in posing and post production. 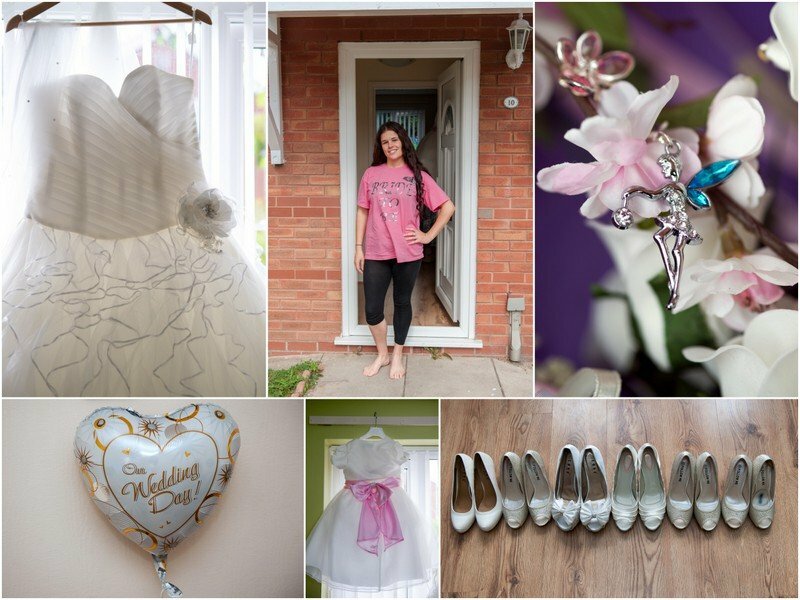 It was a packed day, including 2 sessions with the lovely Katie Robinson, our model for the day, as well as tips on the workflow of a wedding and album designing. 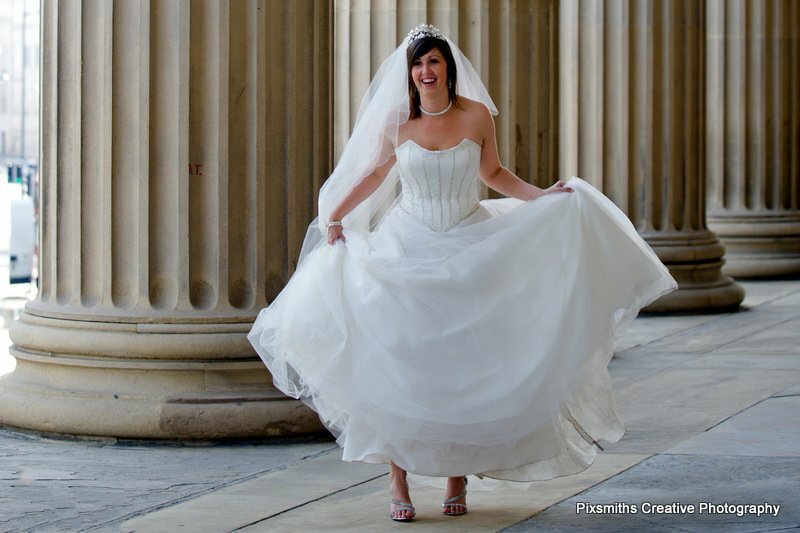 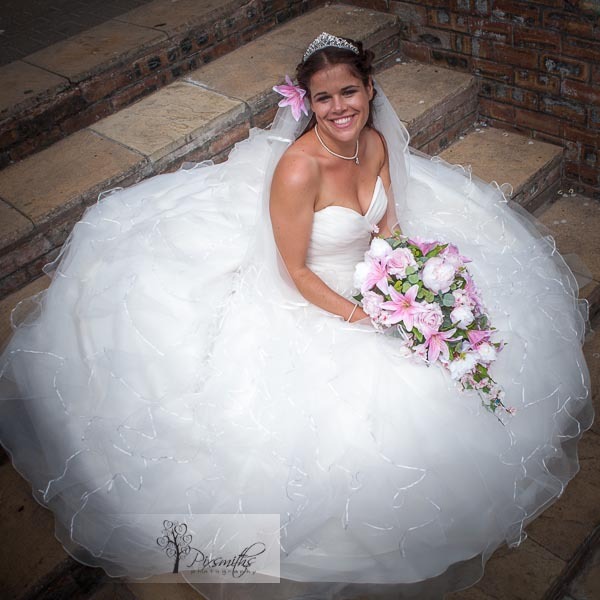 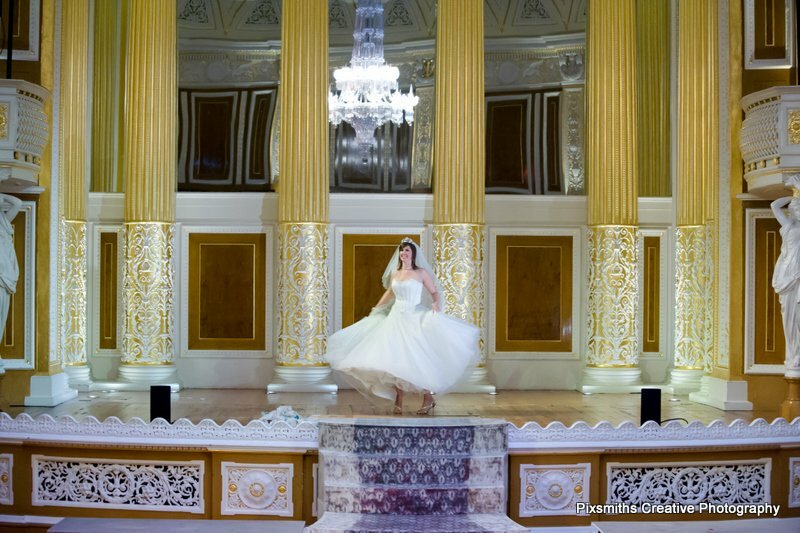 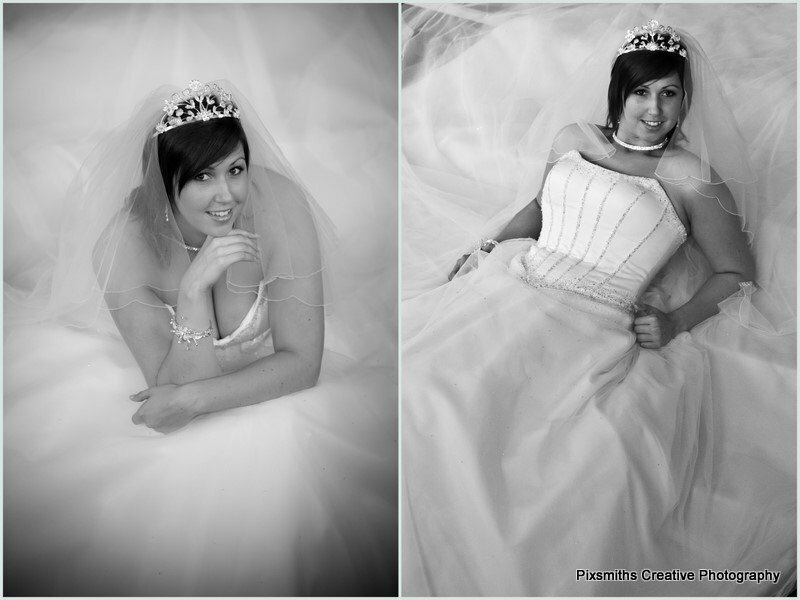 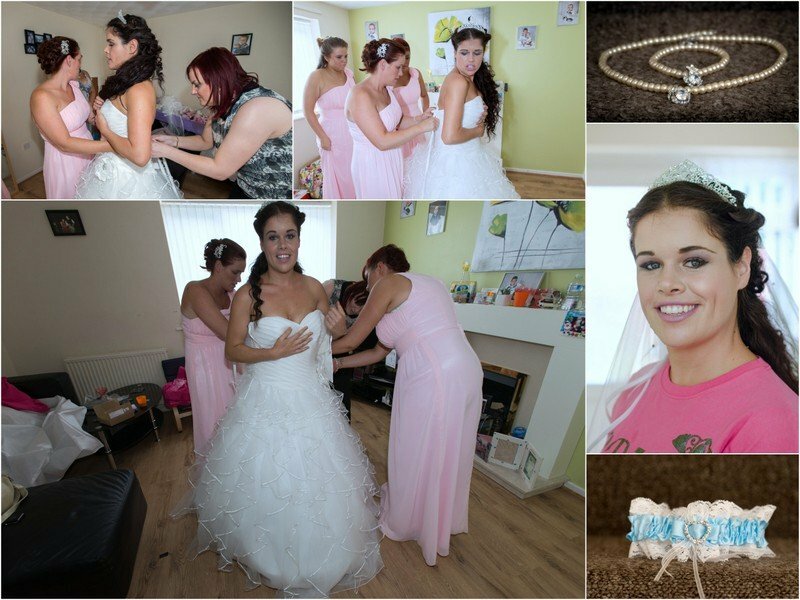 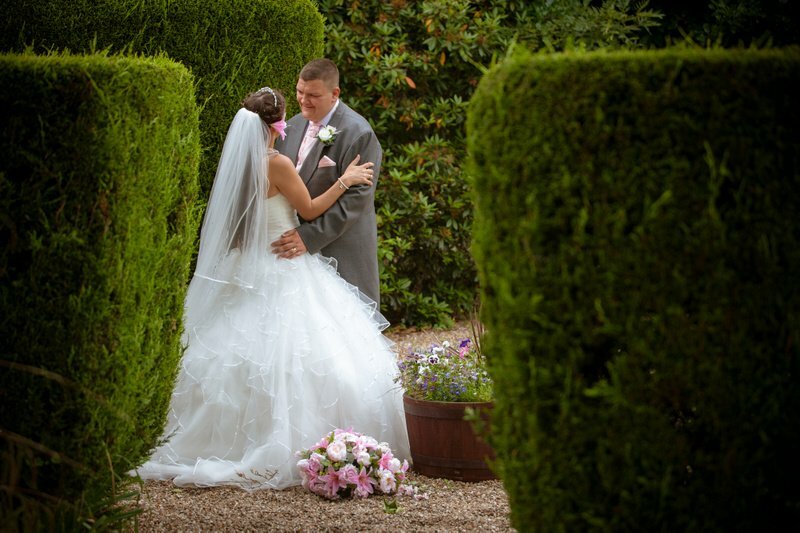 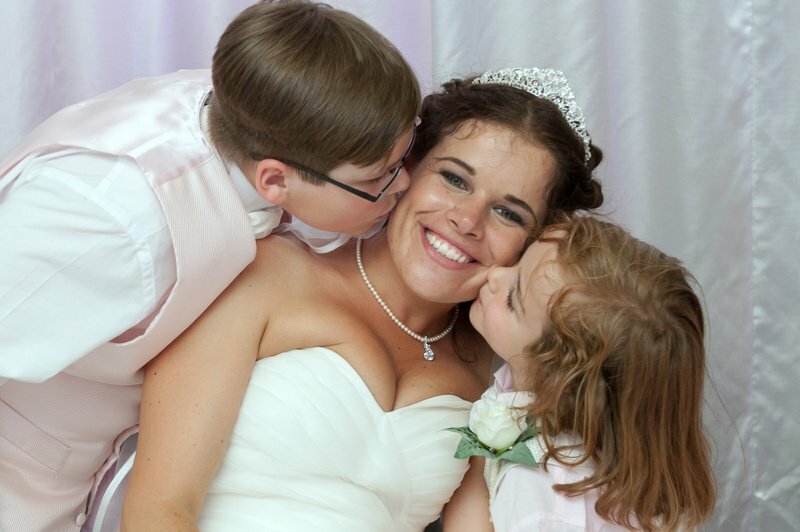 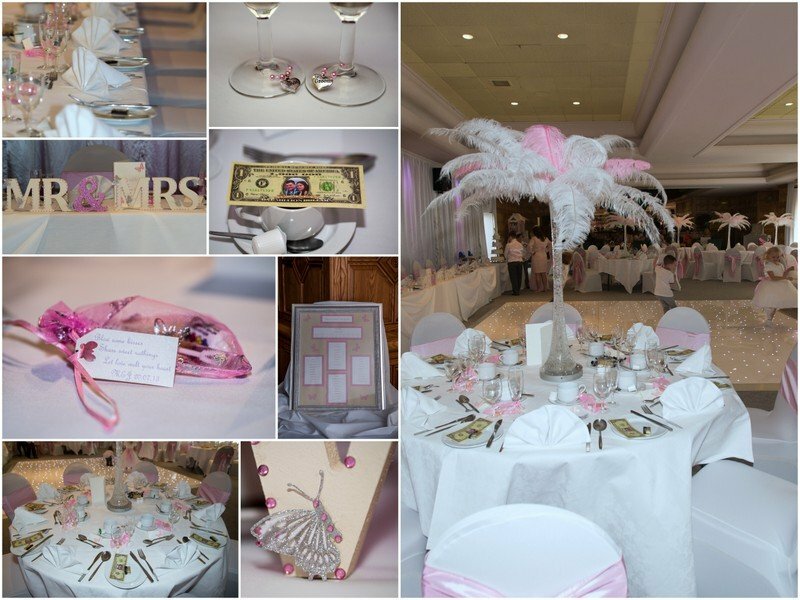 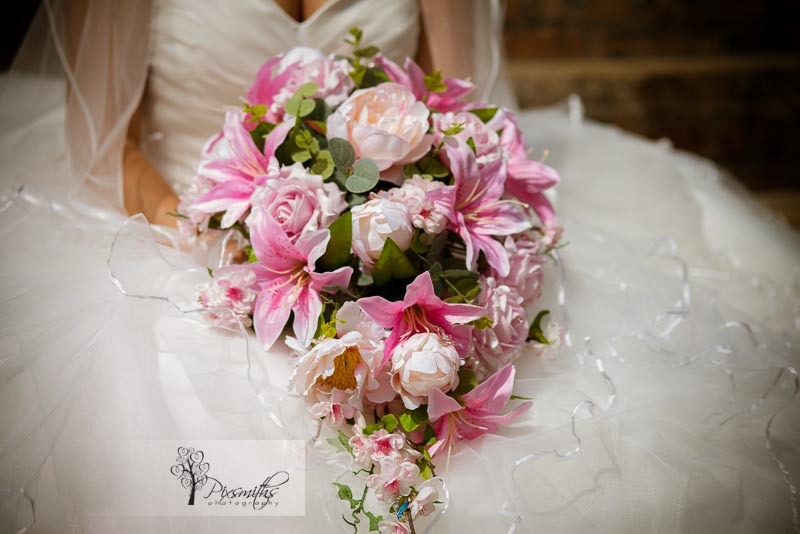 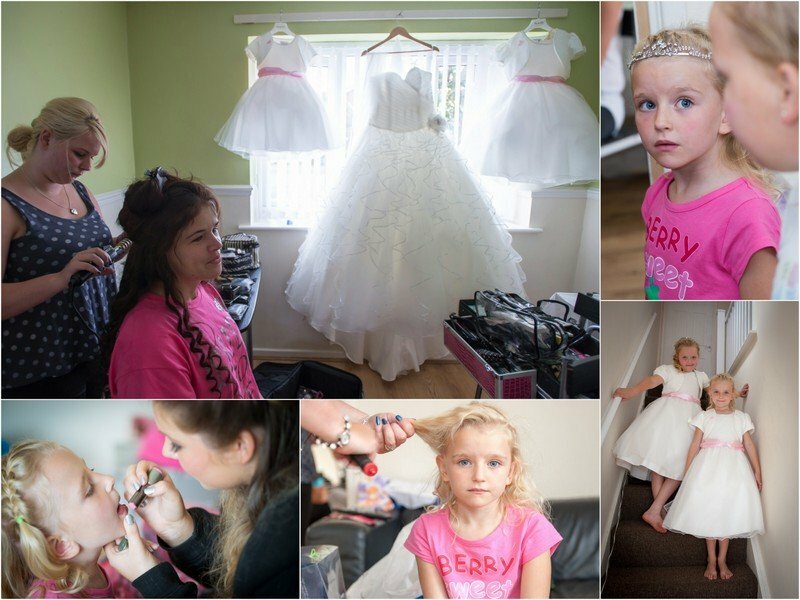 Pixsmiths are always striving to improve and develop and I’m sure our brides in 2012 will benefit from this master-class. 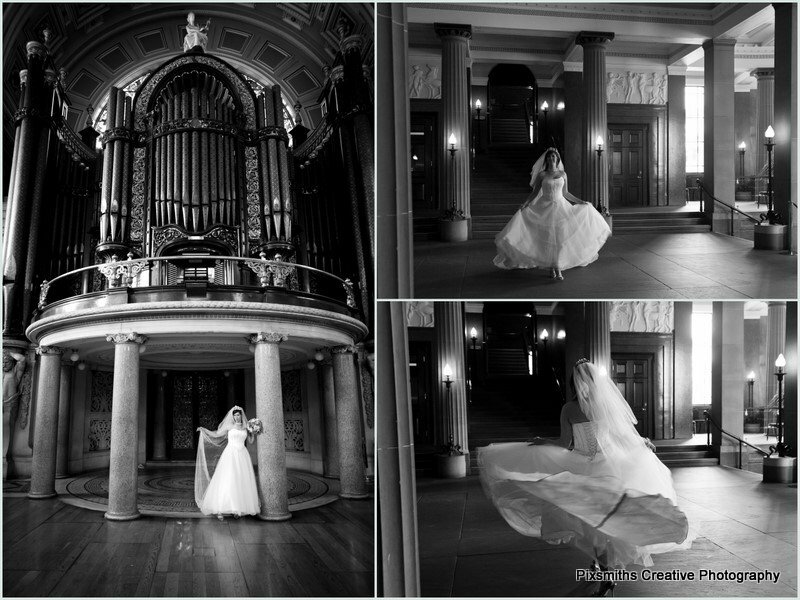 below some of the images taken in and around St Georg’s Hall.